Your browser does not allow frames. 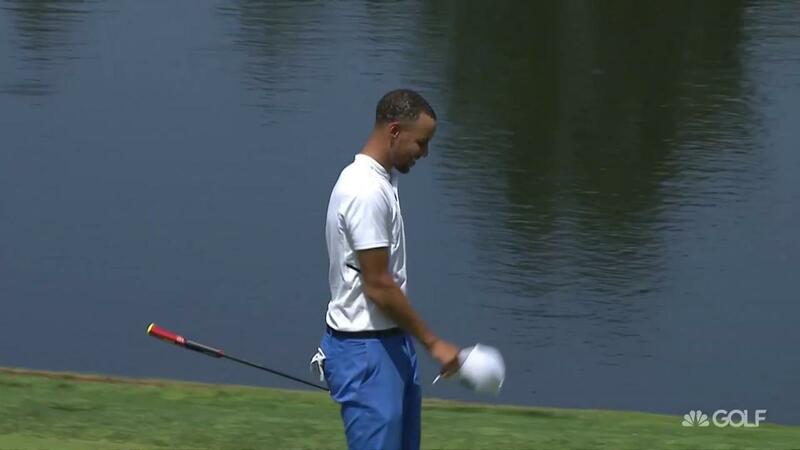 Dell Curry lost a bet to his son Steph and had to take a plunge into the water to pay off his debt at the 2017 American Century Championship. 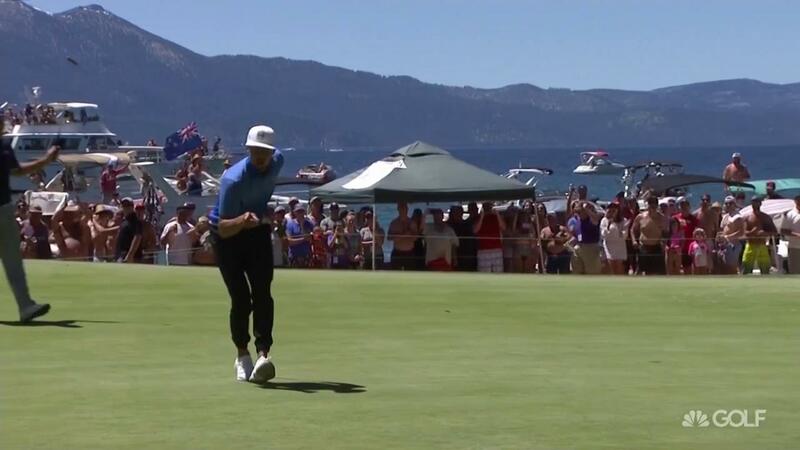 Steph Curry, Aaron Rodgers, and Tony Romo top our list of the best highlights from Sunday at the American Century Championship from Lake Tahoe. 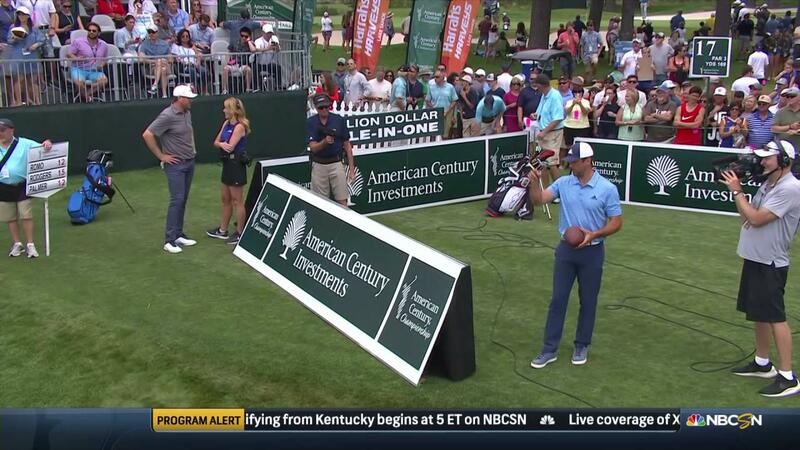 Tony Romo wins the American Century Championship with Tiger Woods' old method putter. 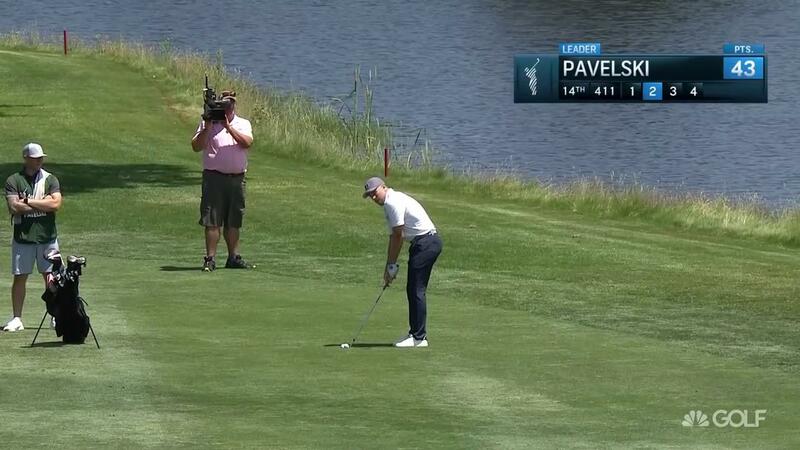 Pavelski sticks it on 18 to give him a chance for eagle and a tie for the lead at the American Century Championship. 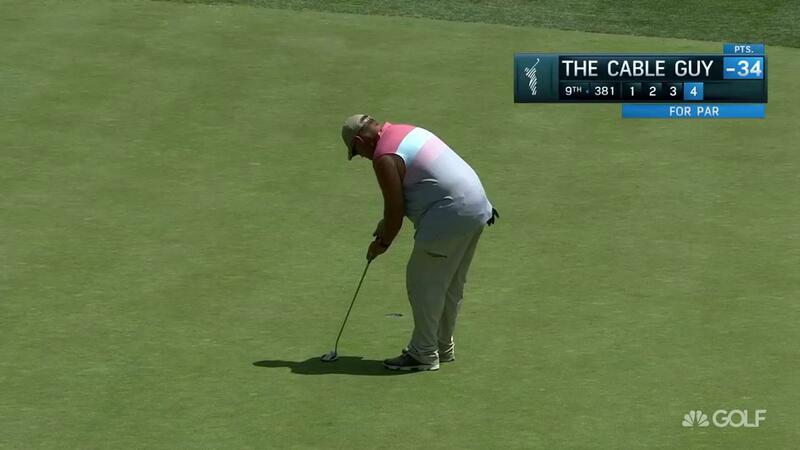 Larry the Cable gets stoked after making his putt at the American Century Championship. 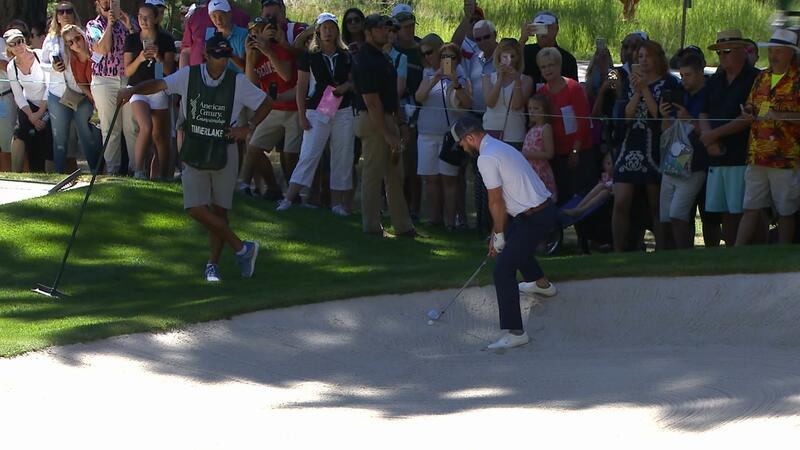 Adam Thielen knocks it close on the 17th hole at the American Century Championship. 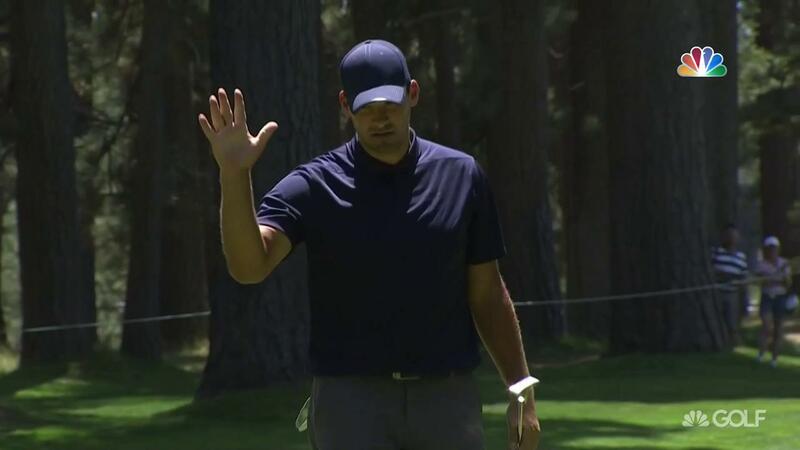 Tony Romo makes a clutch birdie putt on hole No. 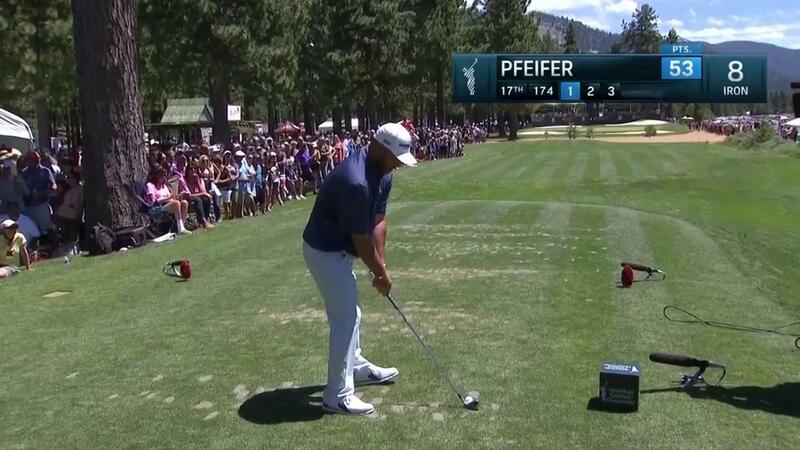 15 in his charge for the title at the American Century Championship. Mark Mulder is clutch with a tight approach on hole No. 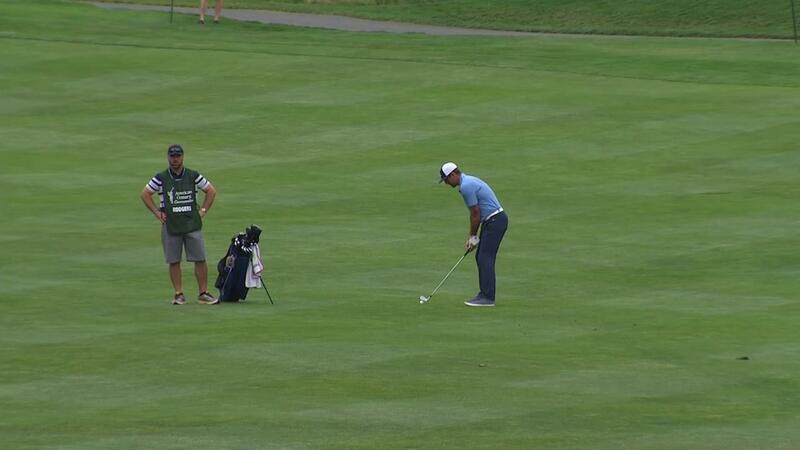 15 during the final round as he goes for his fourth consecutive win at the American Century Championship. 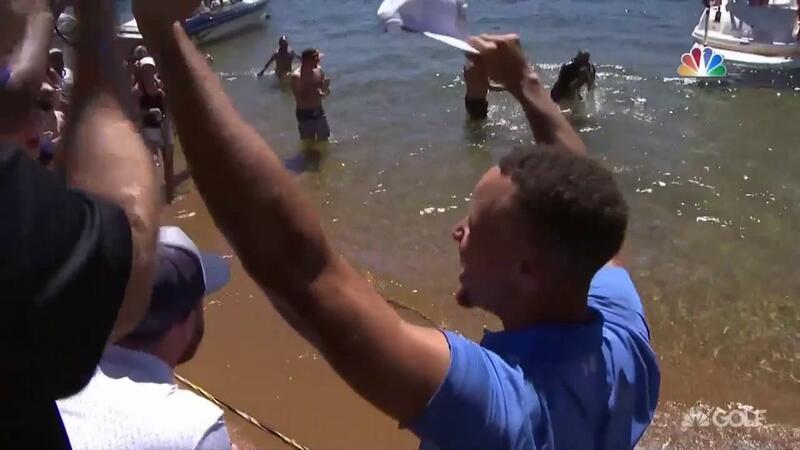 Steph Curry jumps off a boat into the lake after losing a golf bet with his dad at the American Century Championship. 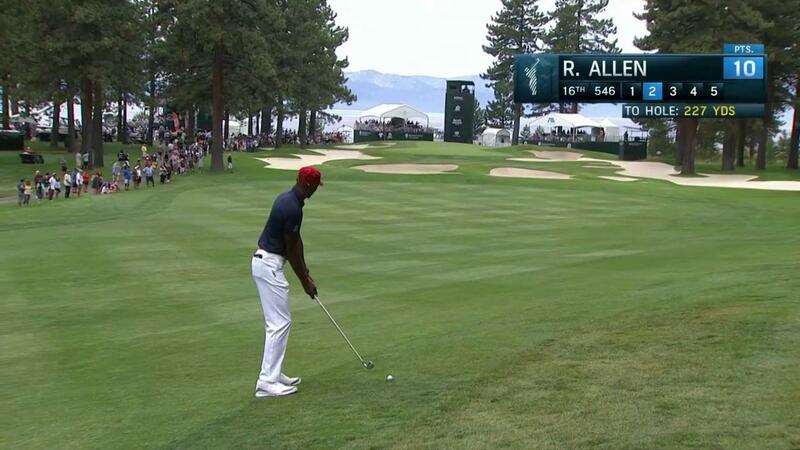 Ray Allen takes the lead with this birdie during the final round of the American Century Championship. 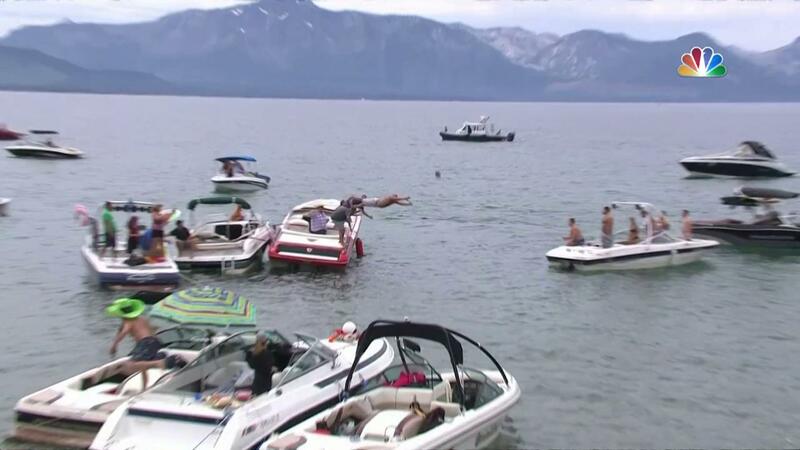 Steph Curry jumps into lake Tahoe after losing a bet with his dad Dell. 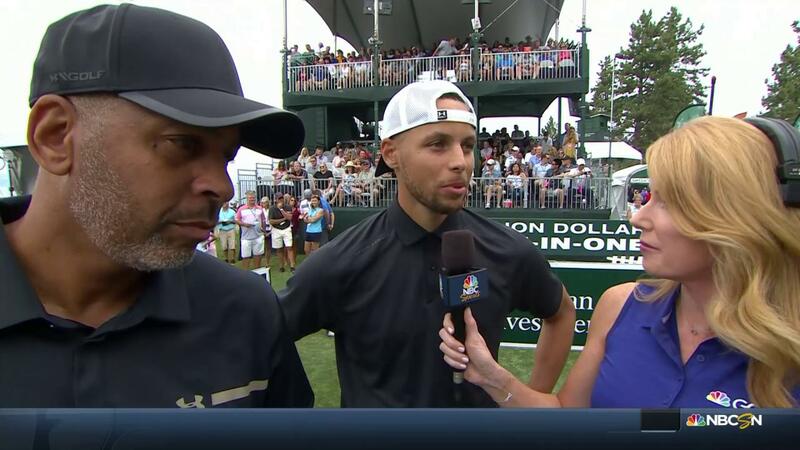 Steph makes par and his dad Dell finds out he won their bet at the American Century Championship. 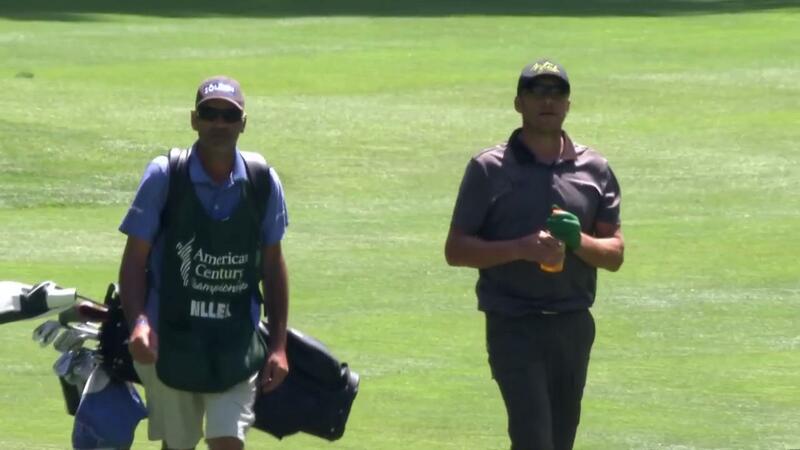 Steph Curry almost holes out from the fairway to beat his dad in a side bet at the American Century Championship. 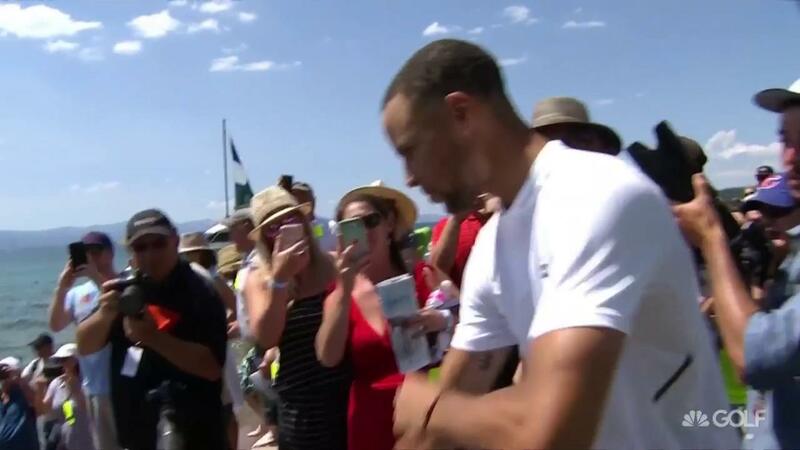 Steph Curry hits his tee shot OB on 18 and would likely lose the bet with his dad Dell, which would would result in him jumping into the lake. 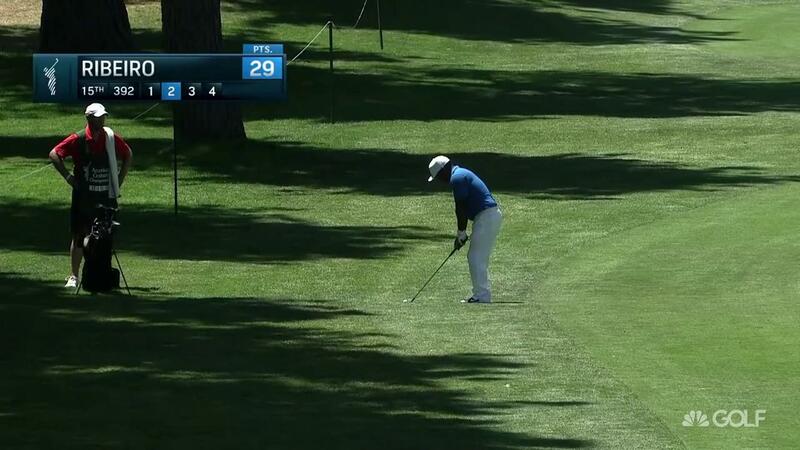 Ray Allen chips it in to save par from the rough on hole No. 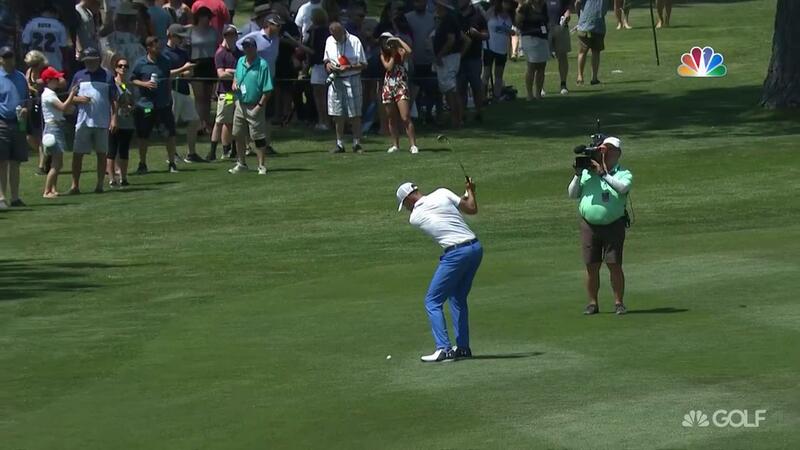 13 during his final round at the American Century Championship. 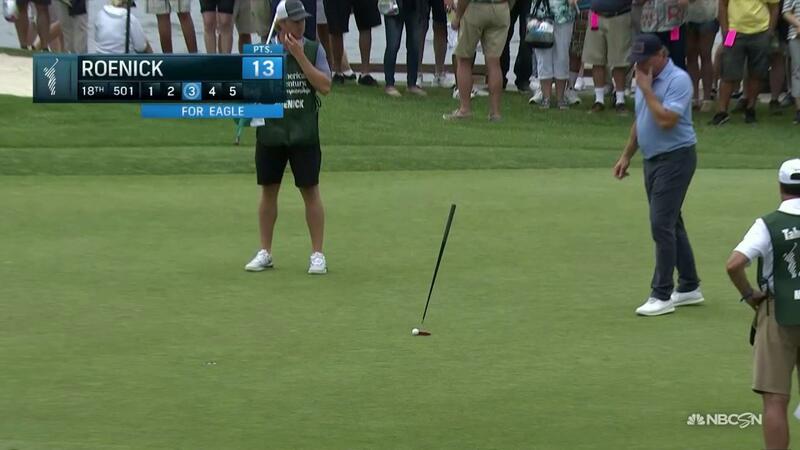 Jeremy Roenick scores with this long birdie putt from the rough in his final round of the American Century Championship. 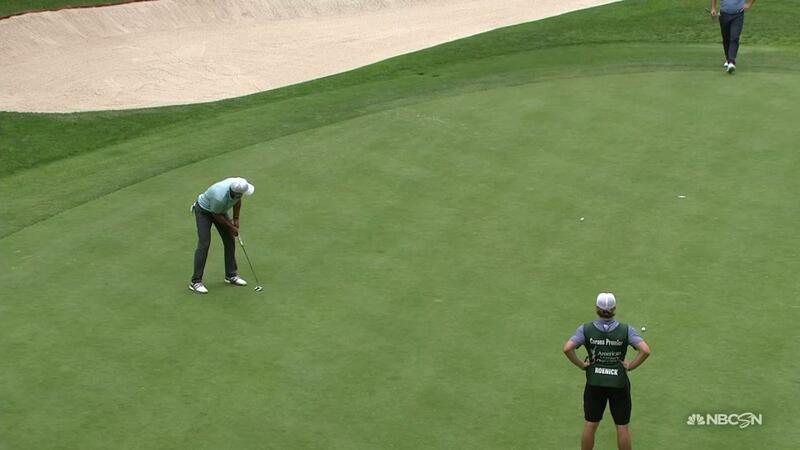 Bode Miller drains his putt for birdie at the American Century Championship. 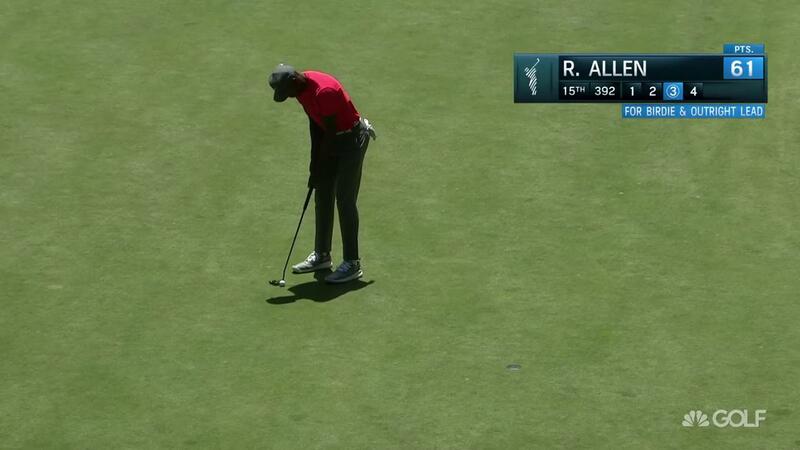 Ray Allen putts from the fringe for another birdie in his final round. 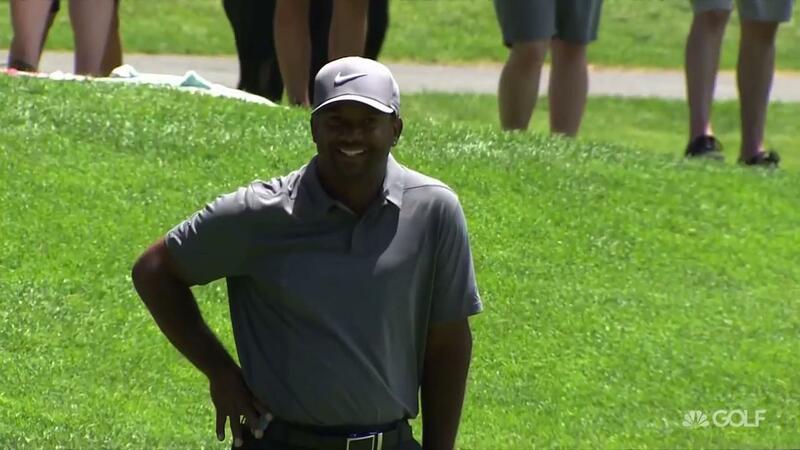 Alfonso Ribeiro sticks it close for a birdie try at the 15th hole in his final round of the American Century Championship. 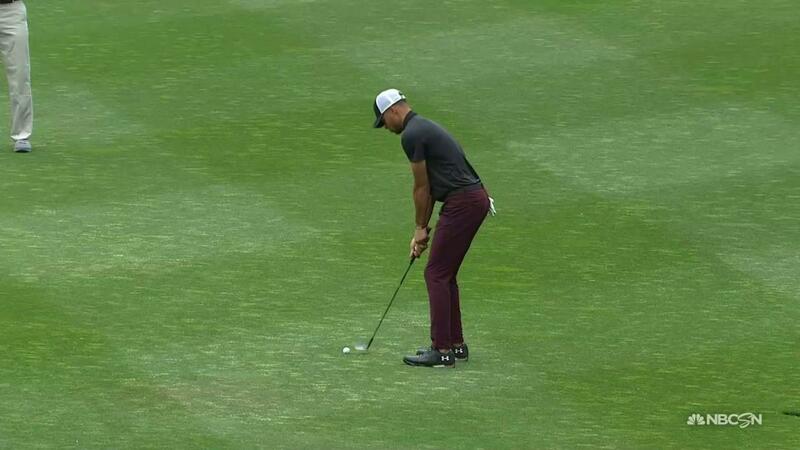 Washington Redskins new quarterback Alex Smith nearly jars his tee shot on the par three 17th hole at the American Century Championship. 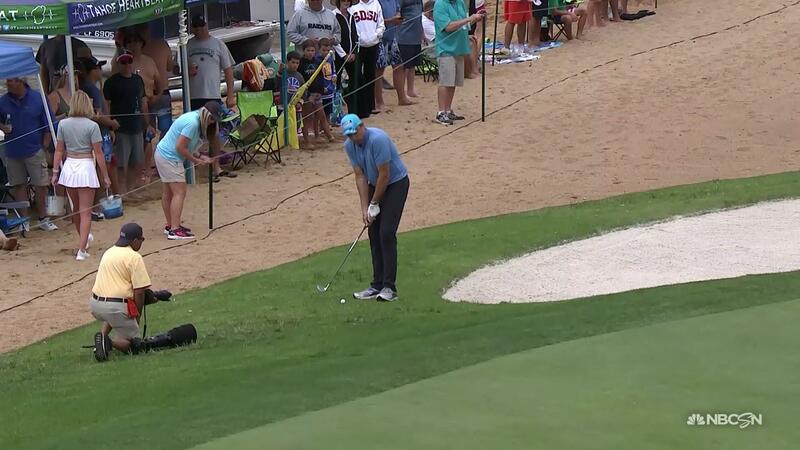 Aaron Rodgers plays his flop shot perfectly from the rough on hole No. 8 at the American Century Championship. Nikki B heads into the crowd to ask fans about their favorite superheroes whether they know it or not. 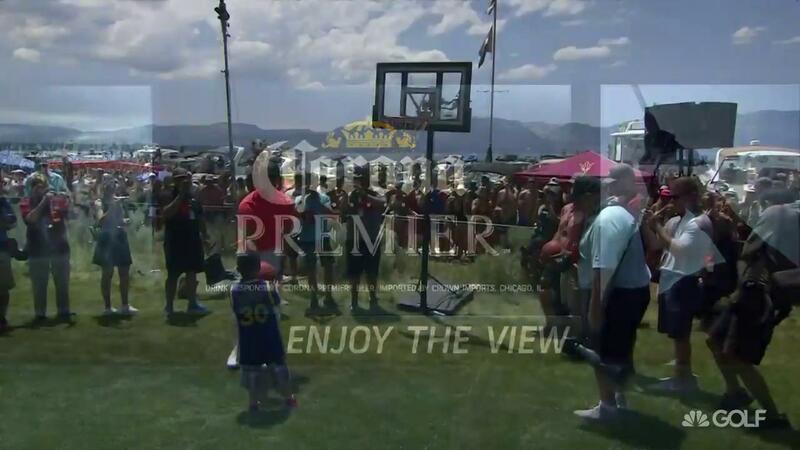 Curry Helps a mini Curry fan dunk, has shootout with dunk contest against Ray Allen and catches a pass without falling from Aaron Rodgers at the American Century Championship. 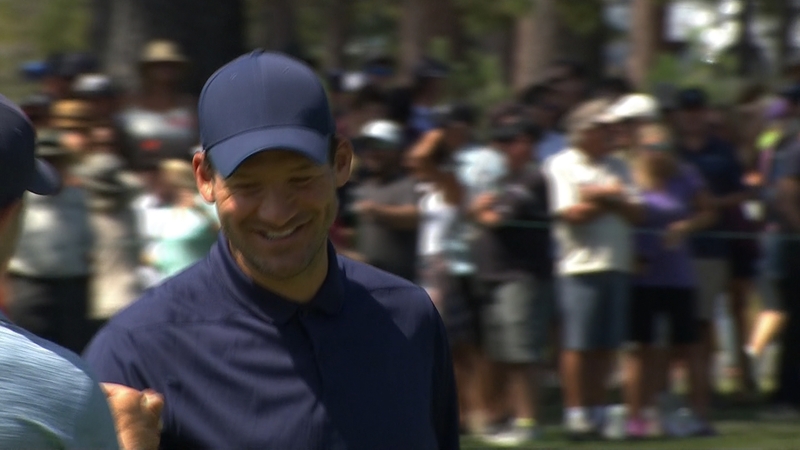 Tony Romo scrambles for birdie and it is easy to see that he is excited when he drains his put with a putter that was made for Tiger Woods. 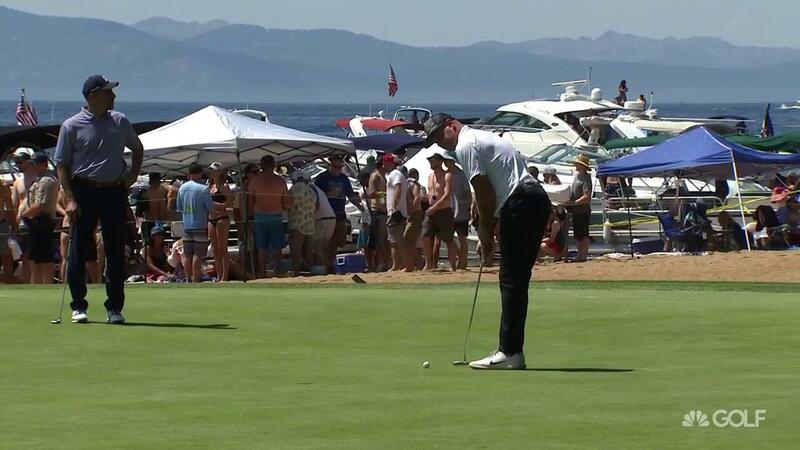 Trent Dilfer celebrates making his birdie putt in unusual fashion as he dives into the crowd lining the beach at the American Century Championship. 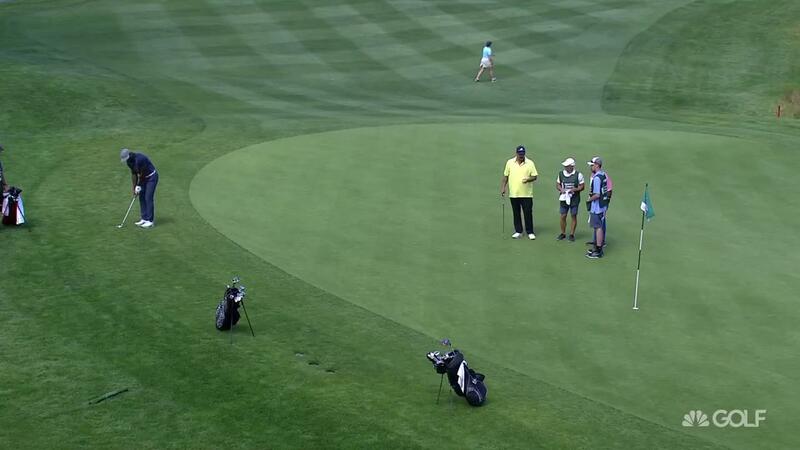 Former NFL coach Herm Edwards takes a shortcut to the hole at the American Century Championship. 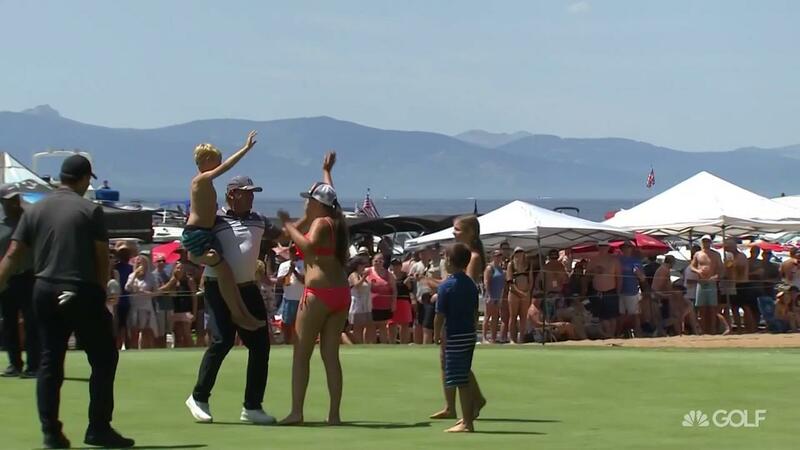 Jeremy Roenick takes an opportunity to include some young fans while reading his putt, then celebrates when he makes it. 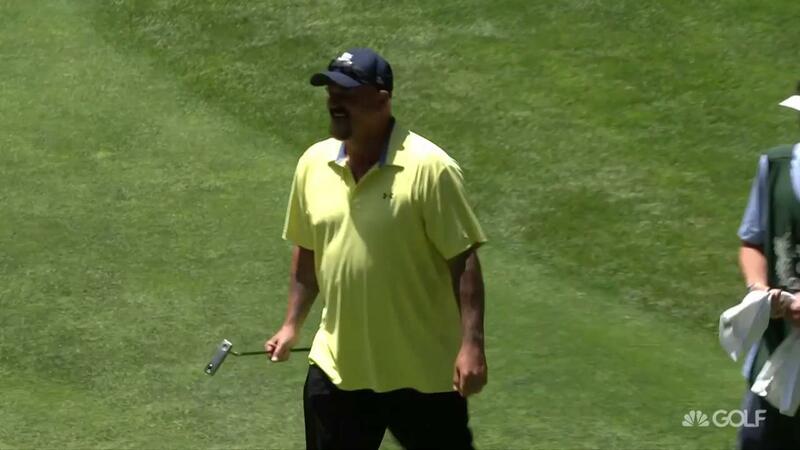 Larry the Cable Guy finds the green on hole No. 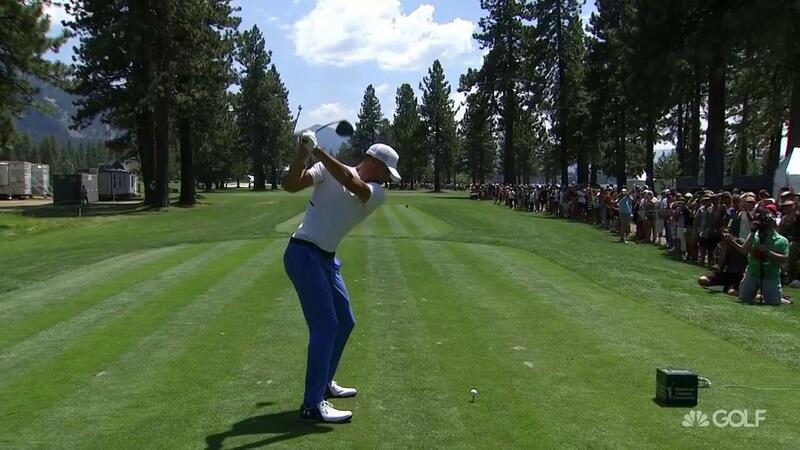 7 with his unorthodox swing at the American Century Championship. 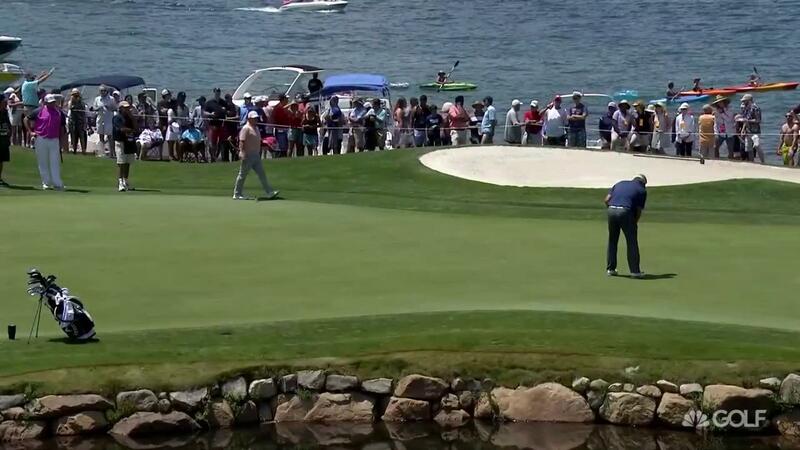 Mark Mulder, Jack Wagner, and Mardy Fish all hit it incredibly tight on the infamous hole No. 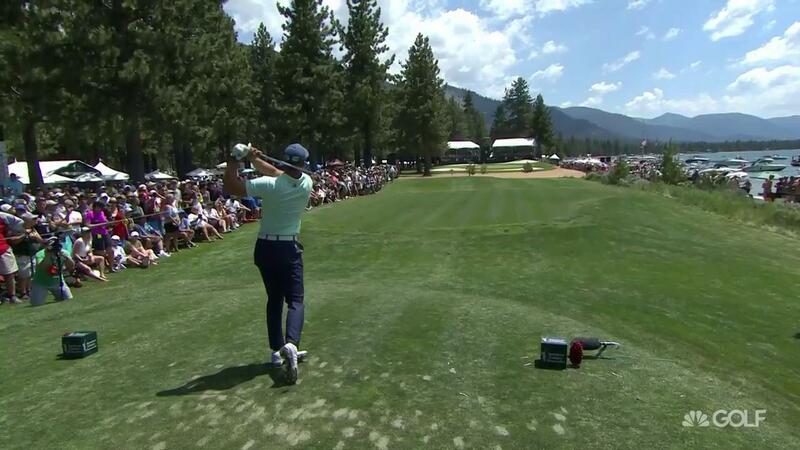 17 at the American Century Championship. 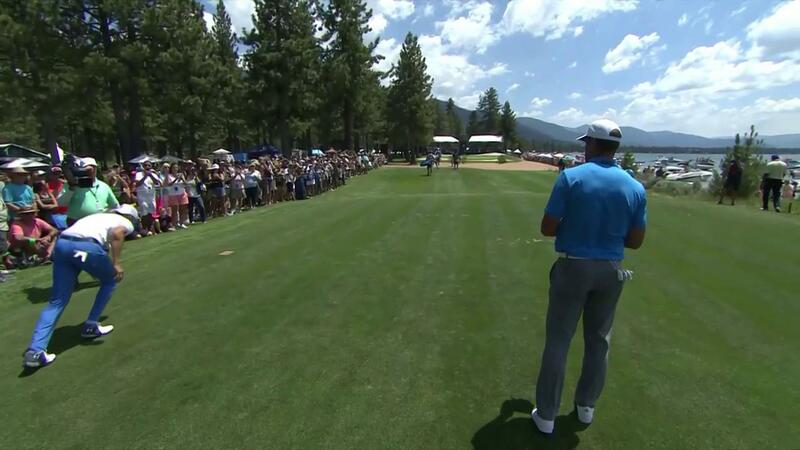 Aaron Rodgers calls his shot early from the rough on hole No. 16 at the American Century Championship. 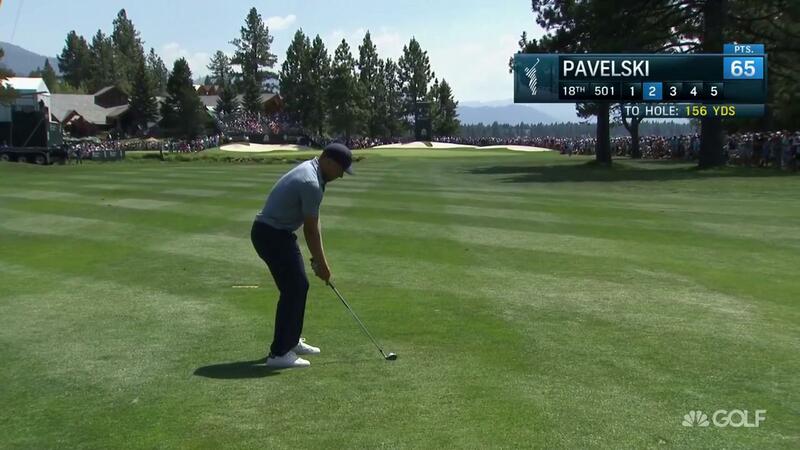 Joe Pavelski keeps hitting fairways and knocking it close during his second round at the American Century Championship. 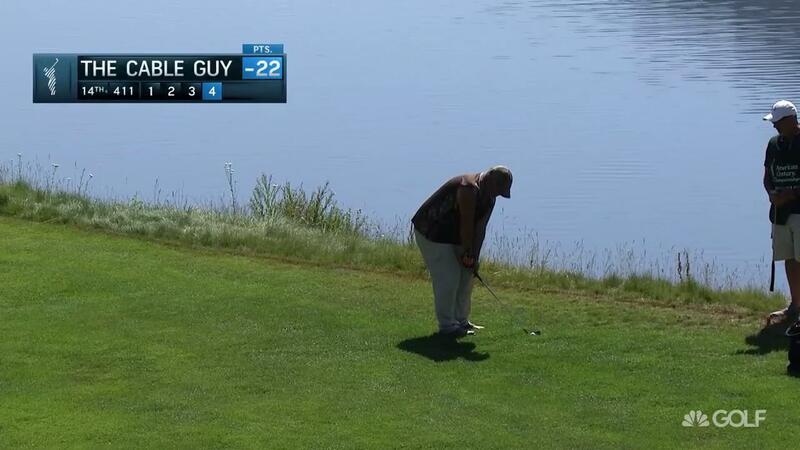 Alfonso Ribiero makes another chip from off the green but this time Jeremy Roenick is right there to celebrate with him. 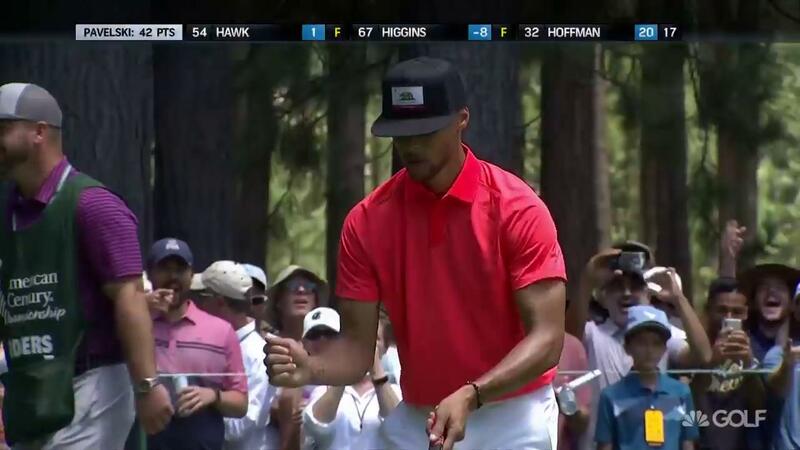 Steph Curry makes his birdie putt and shimmies in celebrations during his second round at the American Century Championship. 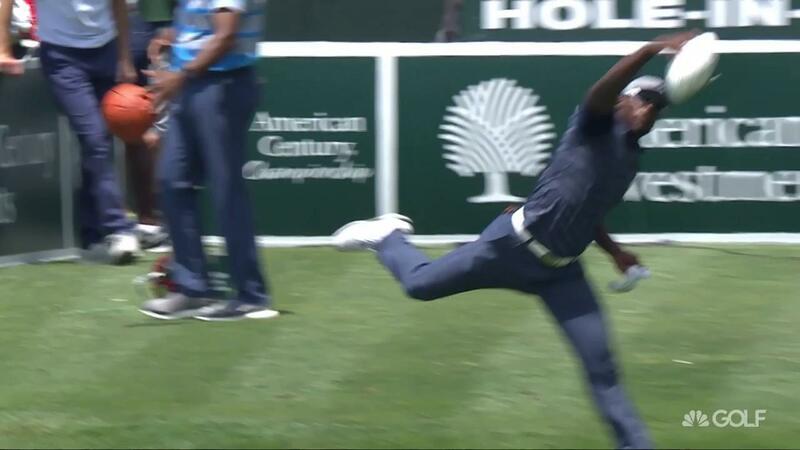 Catch this unreal snag by Patrick Peterson after hitting his tee shot at the American Century Championship. 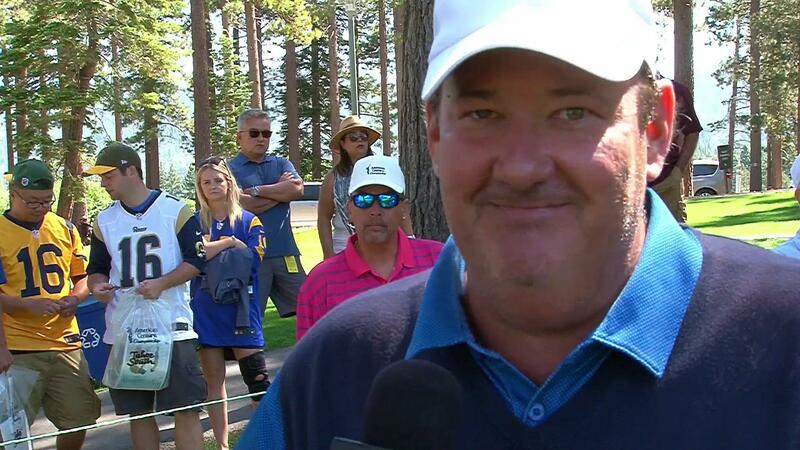 Brian Baumgartner remembers the time he threw his 6-iron through a pane of glass at the American Century Championship. 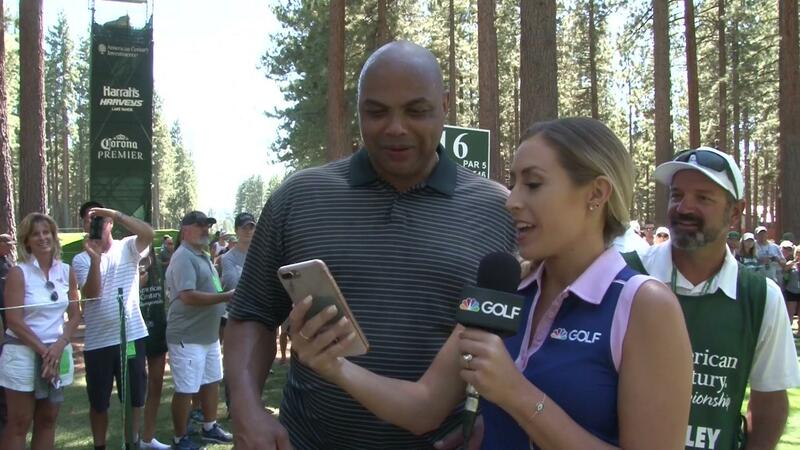 Nikki B caught up with Charles Barkley after he gave her some love advice 10 years ago. 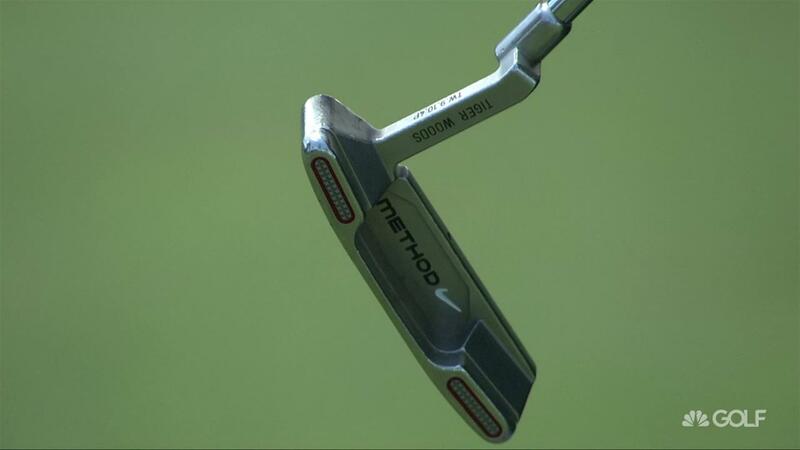 Even Tiger Woods' putter can't help Tony Romo make the difficult putts but just the idea that he has one of Tiger's putters is pretty cool. Mark Rypien drains a lengthy putt on hole No. 10 during his second round of the American Century Championship. 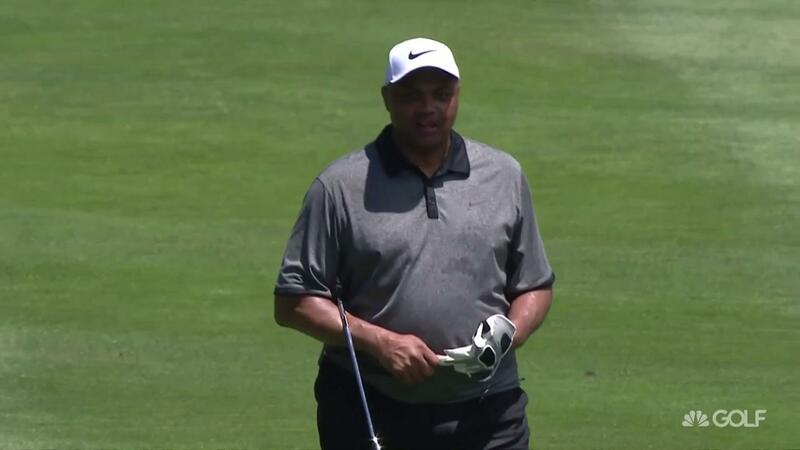 Charles Barkley shows no sign of the infamous hitch in his golf swing during his second round of the American Century Championship. 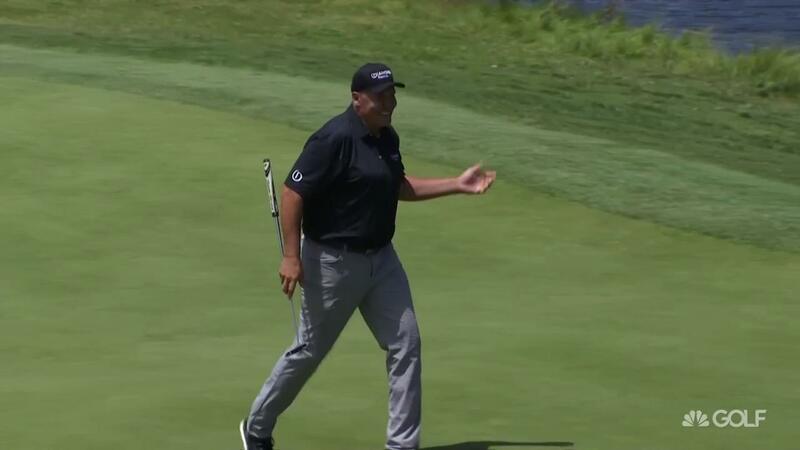 David Wells 'knows what perfection is' and shows it when he sinks a long putt for birdie. 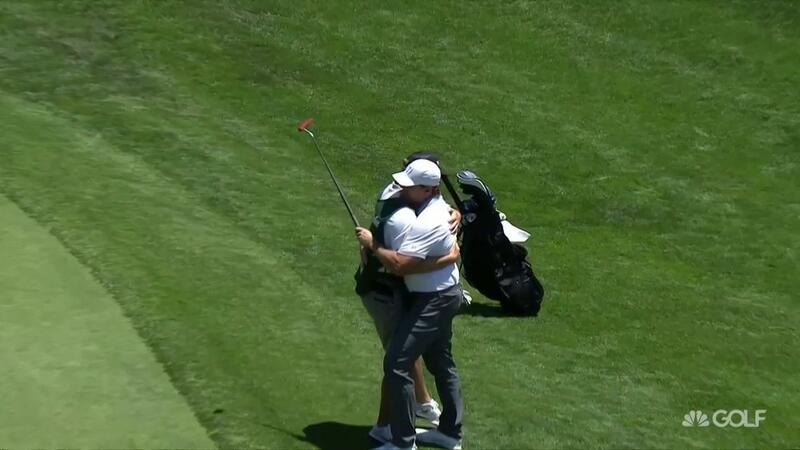 Doug Pederson gets some tree love at the seventeenth hole during his second round of the American Century Championship. 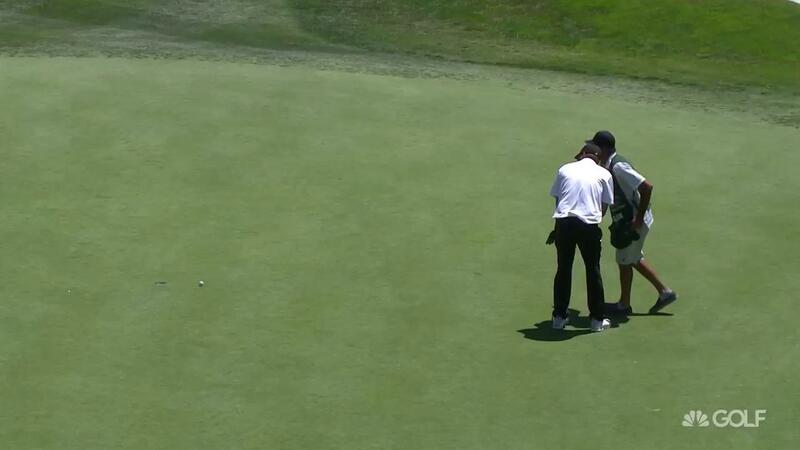 Are there regulations against drinking while putting? 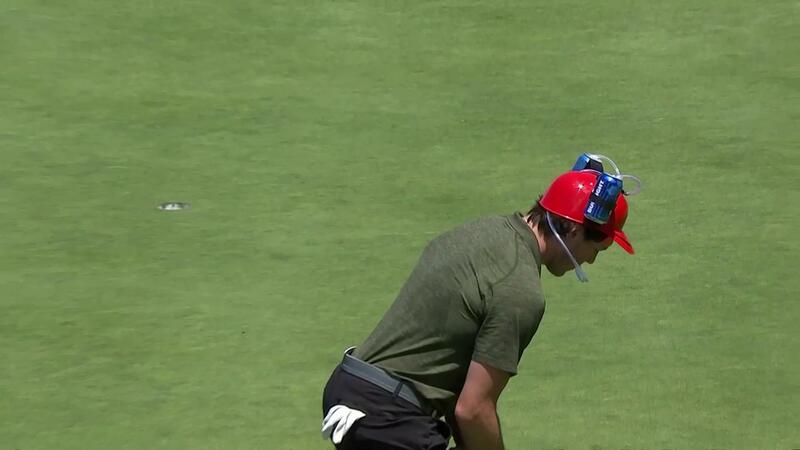 T.J. Oshie putts while wearing a beer helmet, but the real question is are there any regulations against drinking while putting. 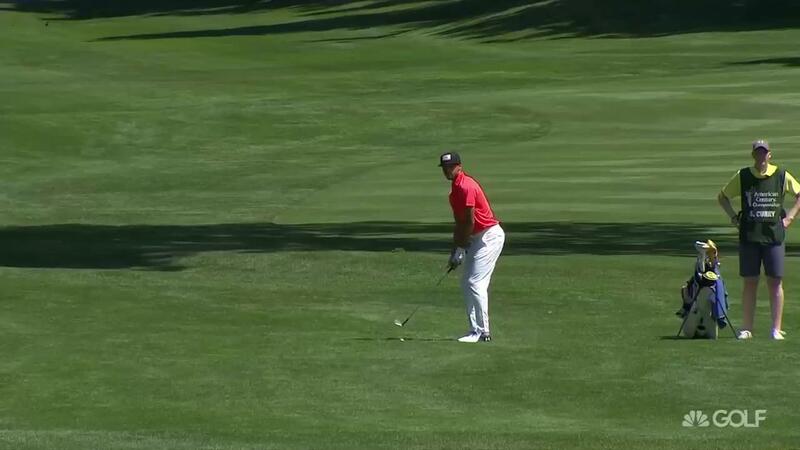 Steph Curry showing off his wedge play at the eighth hole during his second round of the American Century Championship. 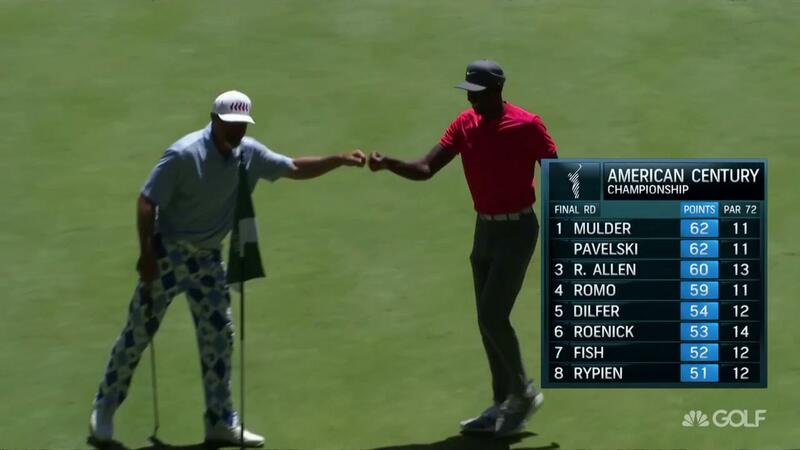 Patrick Peterson chips in from off the green to earn a fist bump from a fan at the American Century Championship. 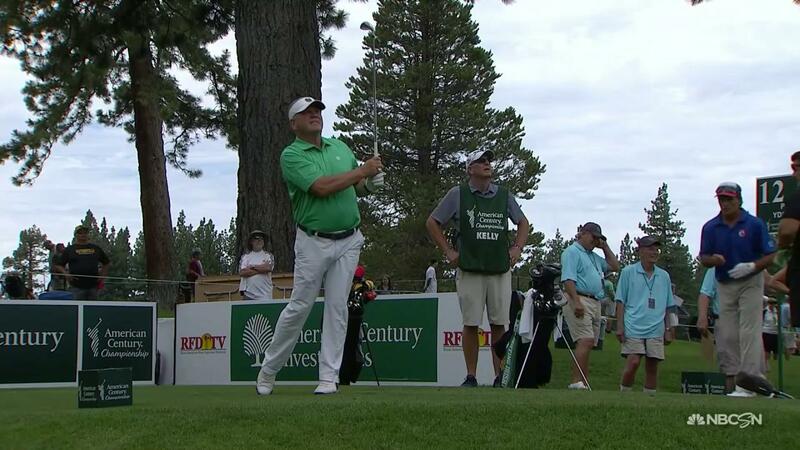 Larry the Cable Guy flips the ball up in the air then flops when he makes it at the American Century Championship. Bode and Morgan Miller experienced every parents worst nightmare when their 19 month old daughter drowned in a pool but have taken the opportunity to help increase water safety education. NFL coaches Sean Payton and Doug Pederson discuss the bet that have that will benefit Autism in Philadelphia and New Orleans. 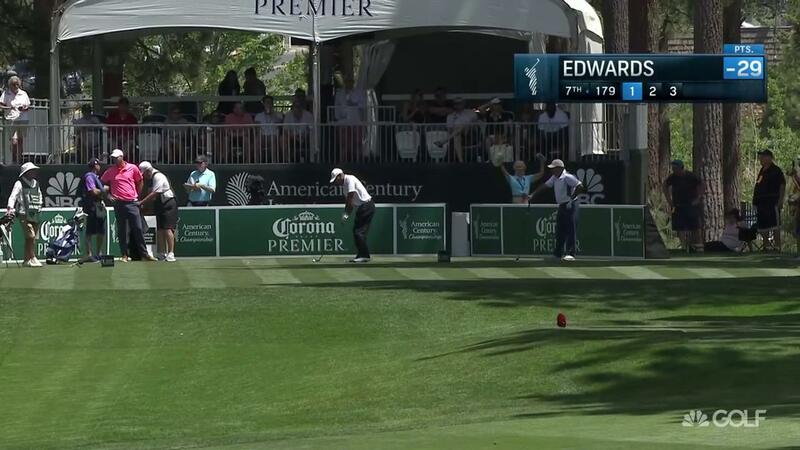 John Smoltz makes a 'walk-off' bank shot at the seventeenth hole during his first round of the American Century Championship. 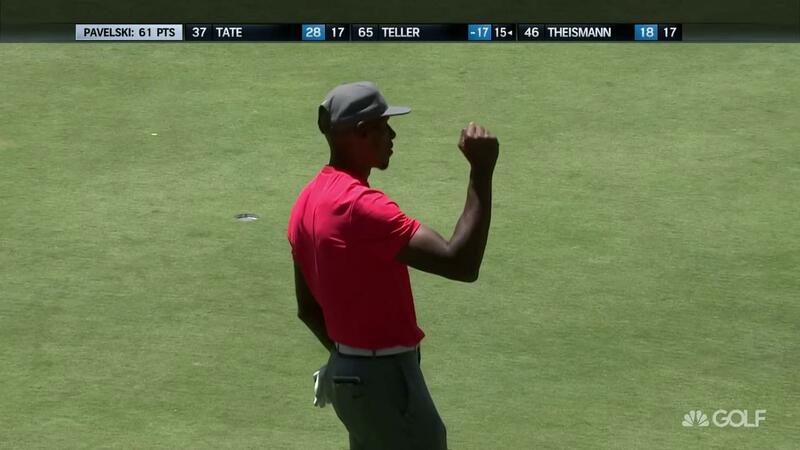 Ray Allen has such a smooth swing he manages to even make eagle putts look easy at the American Century Championship. 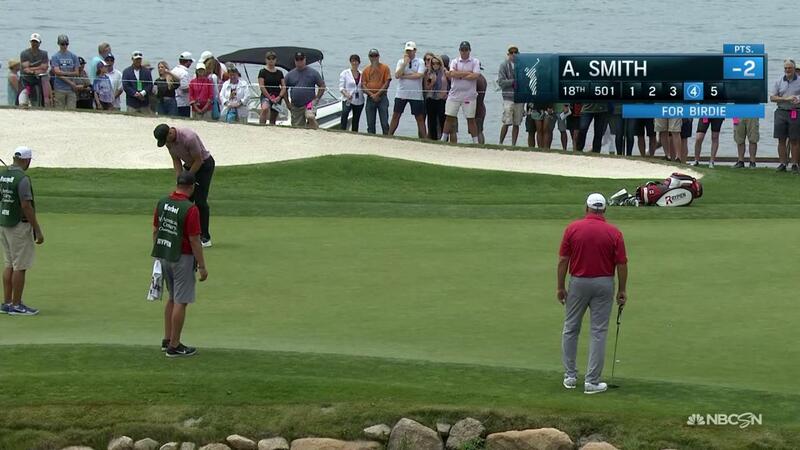 Alex Smith drains his putt to finish strong in his first round at the American Century Championship. 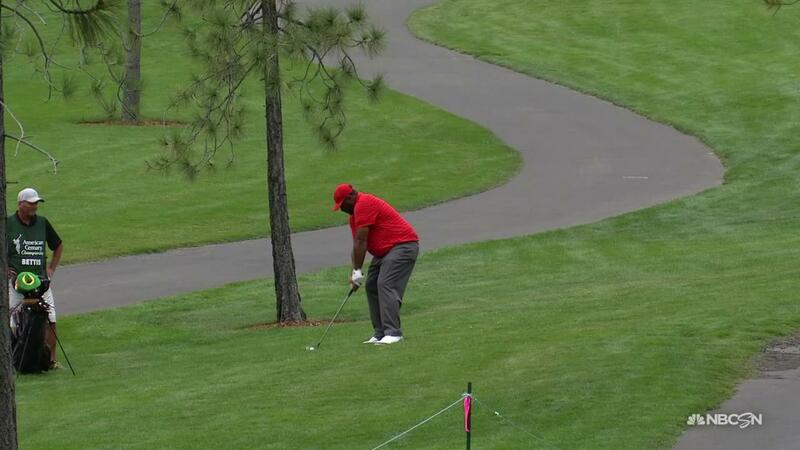 Jerome Bettis chips in from off the green at hole No. 13 during his first round at the American Century Championship. 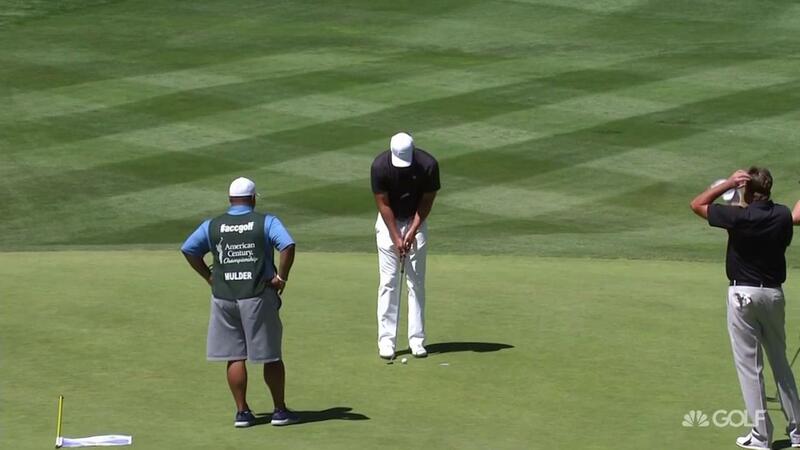 Joe Pavelski drains a long putt for birdie on his way to the first round lead at the American Century Championship. 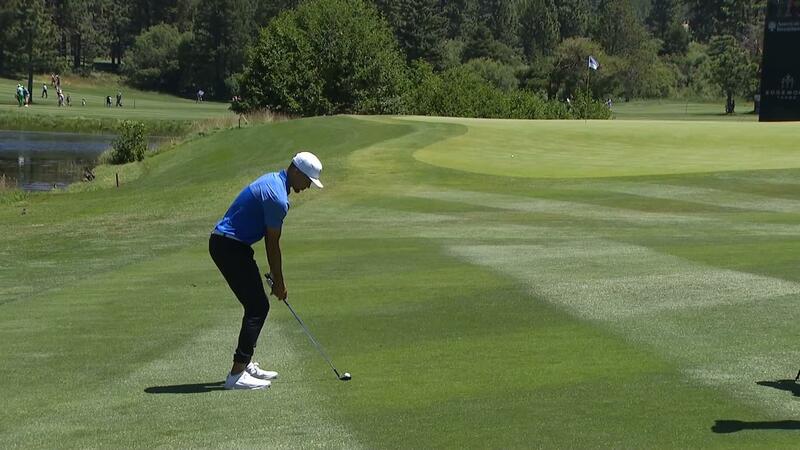 Steph Curry puts some English on his approach shot on hole No. 15 at the American Century Championship. 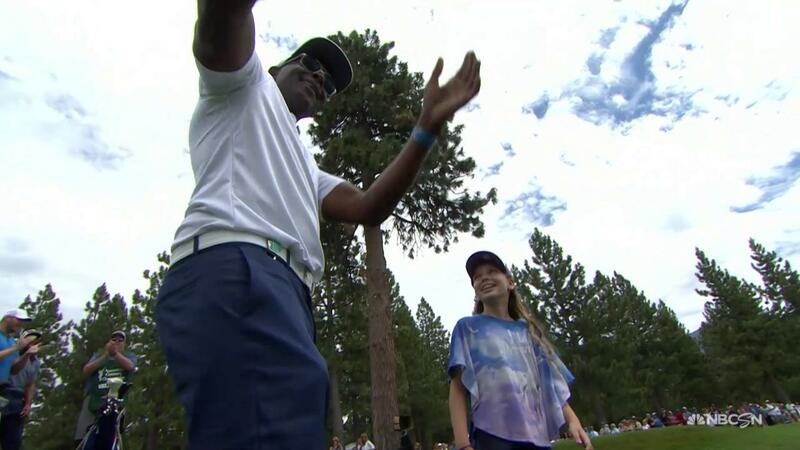 Ray Romano and Alfonso Ribeiro show off more than dance moves at the American Century Championship. 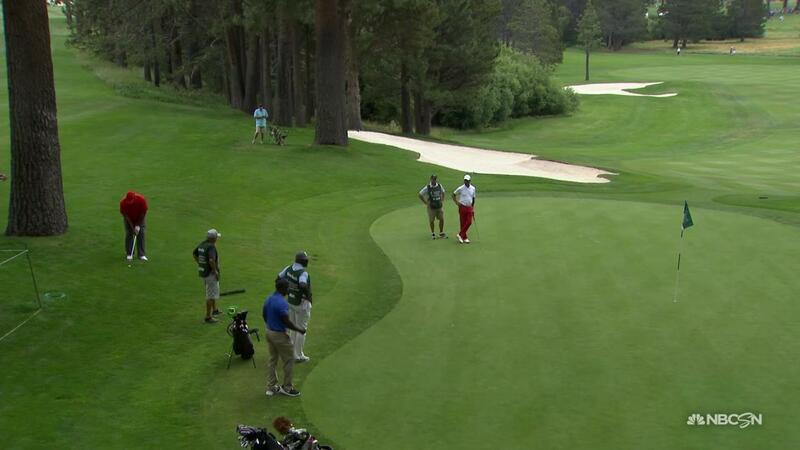 Mike Modano sinks a monster putt on hole No. 15 at the American Century Championship. 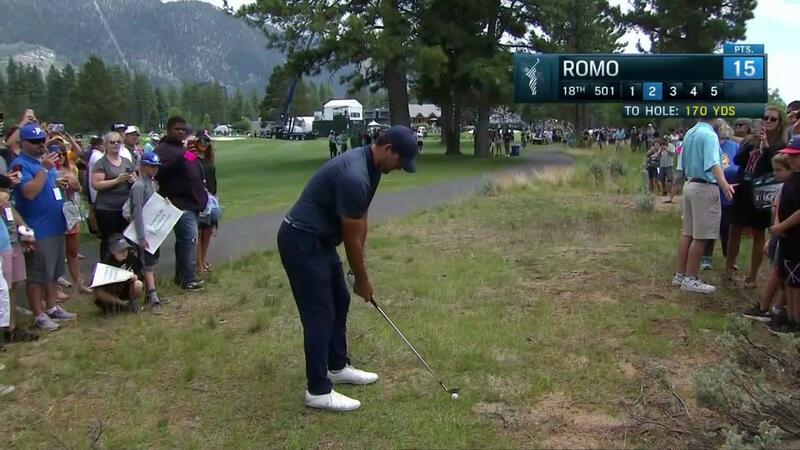 Tony Romo attempts a 'hero' shot from a troubled lie during his fiorst round of the American Century Championship. 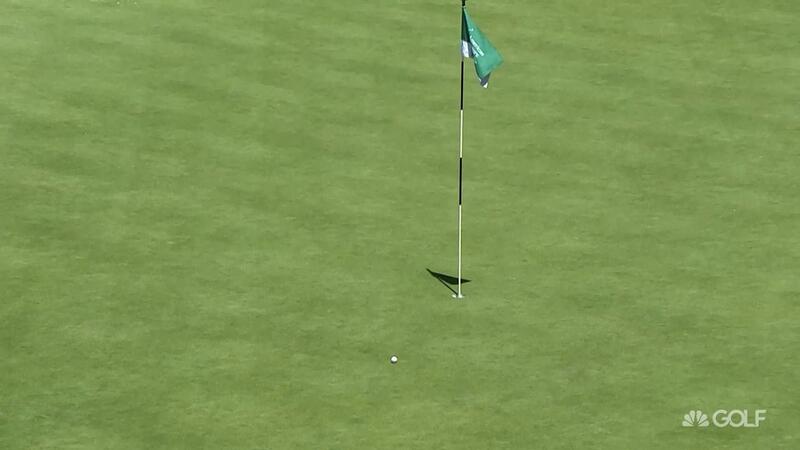 Case Keenum finds the green then makes the long putt for birdie on hole No. 17 at the American Century Championship. 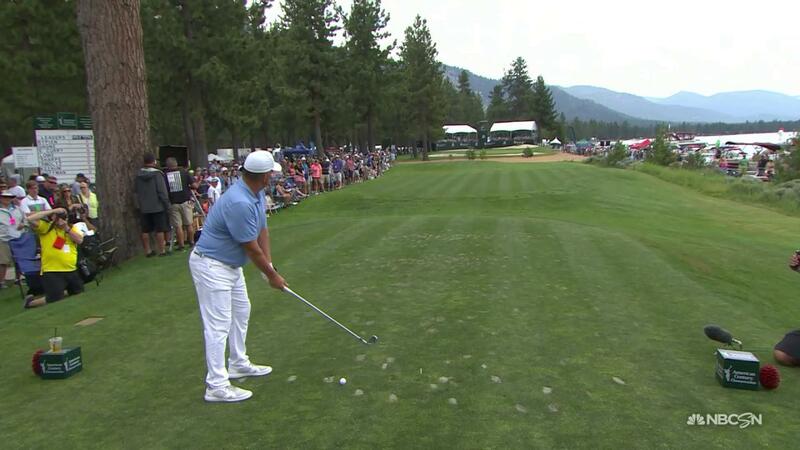 Jeremy Roenick sticks his approach and his putter when he has a chance for eagle at the American Century Championship. 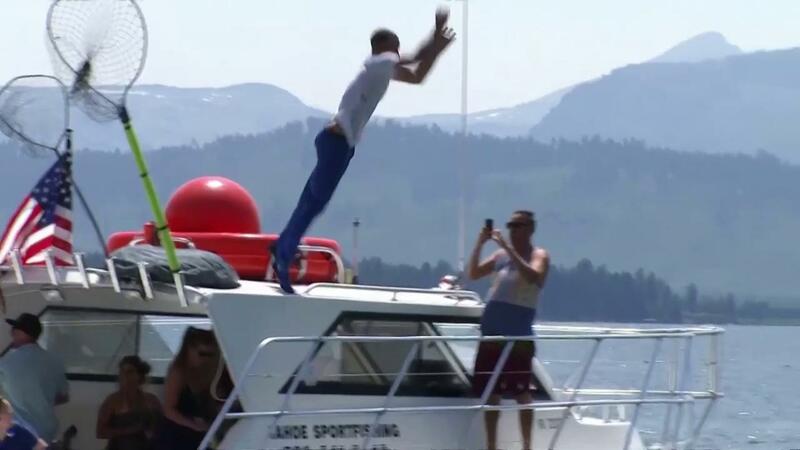 Fan lays out from a boat for a pass from Aaron Rodgers at the American Century Championship. 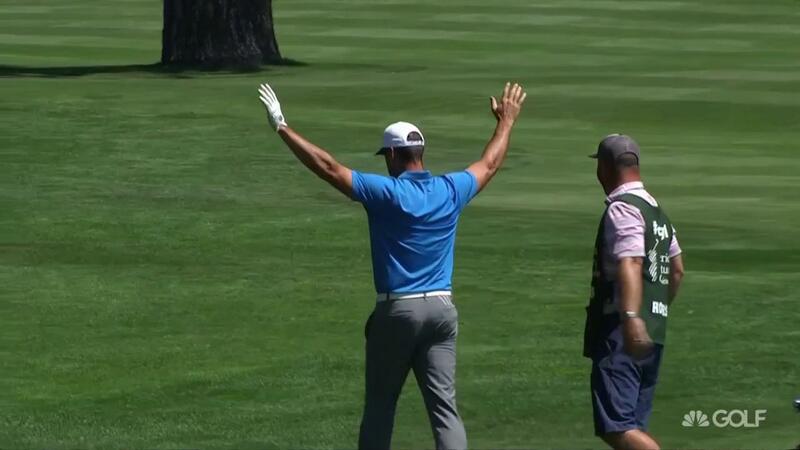 NFL Quarterbacks Blake Bortles, Case Keenum, and Jared Goff joke about the r golf skills and toss some long bombs into the crowd at the American Century Championship. 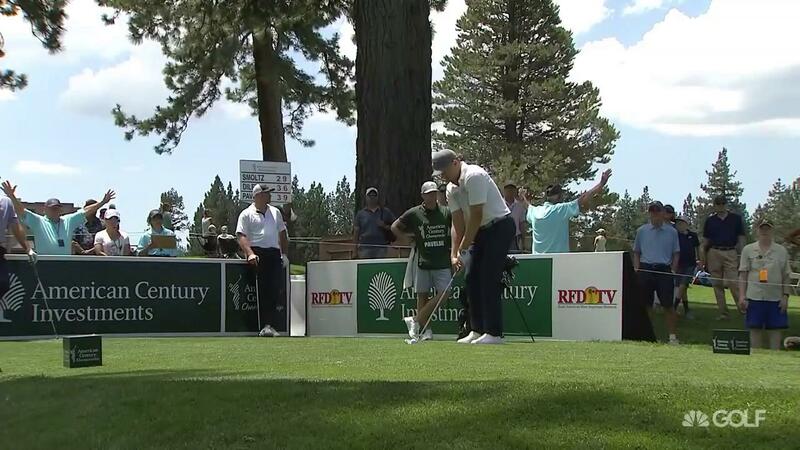 Aaron Rodgers throws a pass over the water to a fan in boat at the American Century Championship. 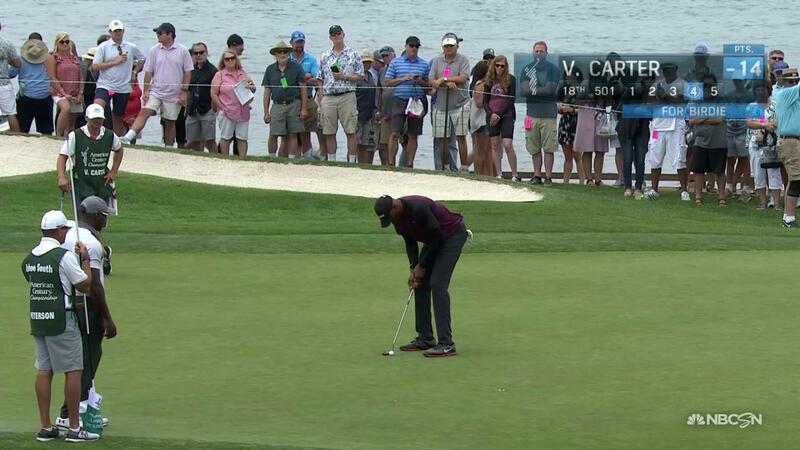 Vince Carter manages to birdie the last hole for some redemption before ending his first round at the American Century Championship. 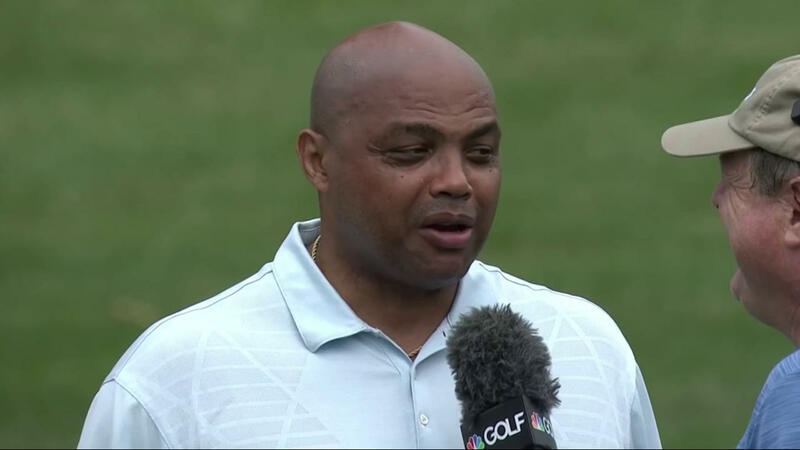 Charles Barkley may be 'choking like a dog' but he can't complain about being on a golf course at the American Century Championship. 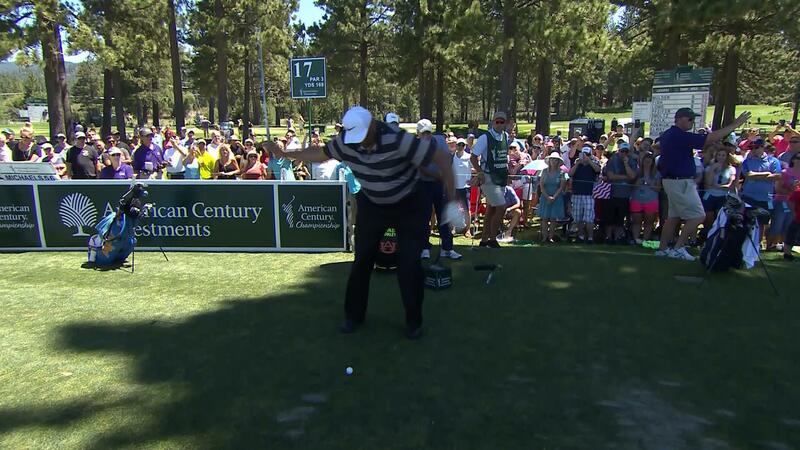 Kevin Nealon pulls out the 'foot wedge' to save double bogey at the American Century Championship. Steph Curry shares his thoughts on LeBron James joining the Lakers. 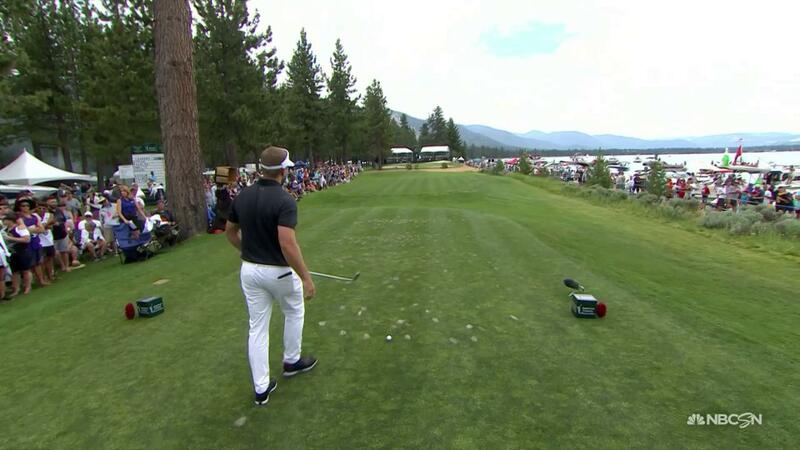 Sean Payton stares his ball down like the pro's do after his tee shot on No. 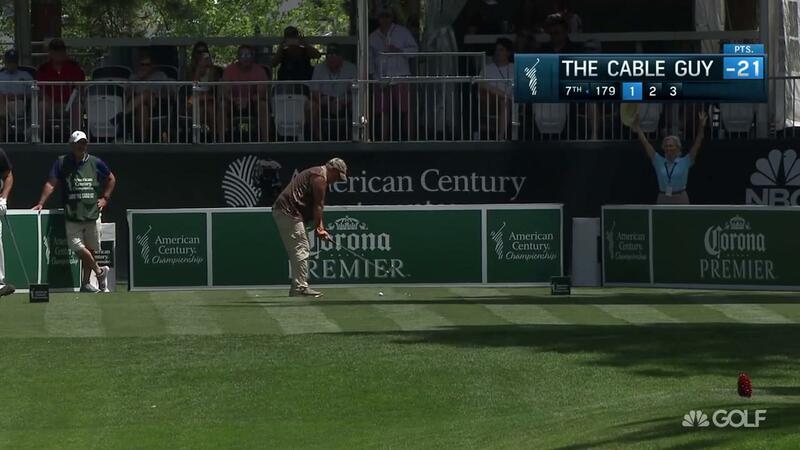 17 at the American Century Championship. 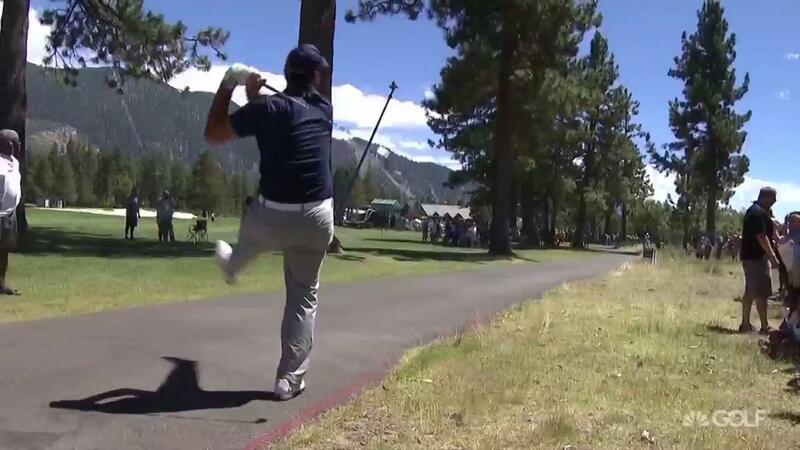 Jerome Bettis nearly jars it from the other side of the cart path during the first round of the American Century Championship. 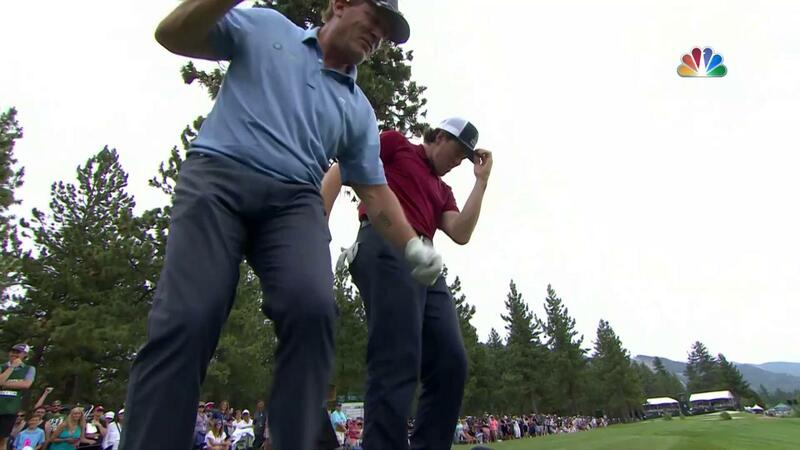 Jeremy Roenick and T.J. Oshie dance for the crowd at the American Century Championship. 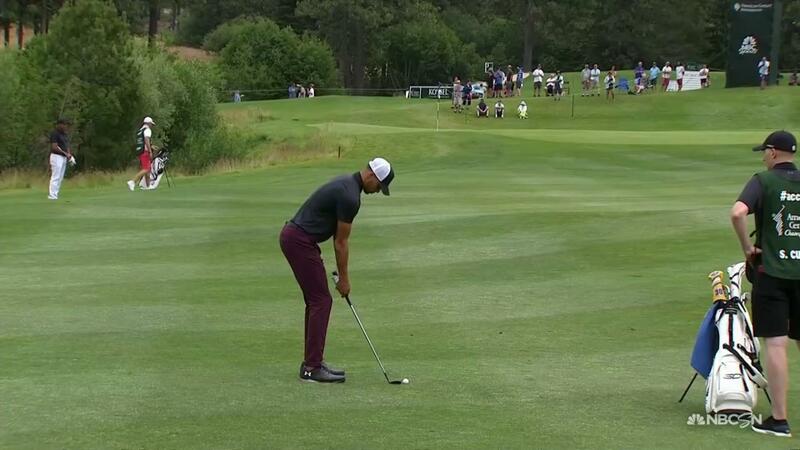 Steph Curry tells his ball to 'bite' on his second shot at hole No. 11 and it listens to him. 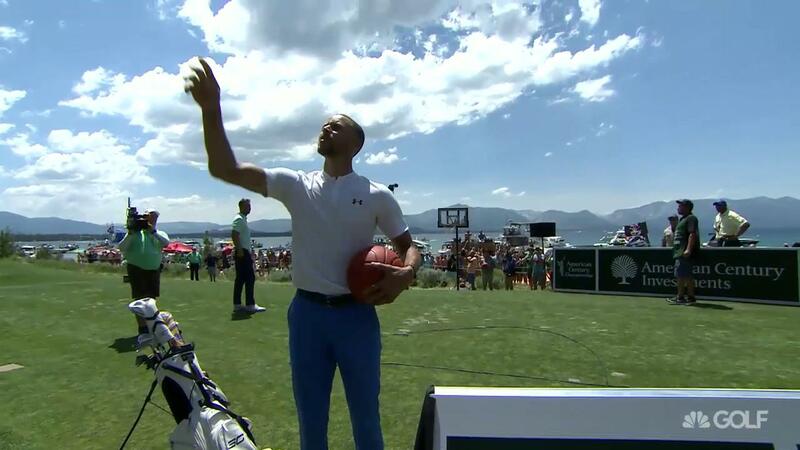 Steph Curry has a near perfect touch around the greens and shows it off on hole No. 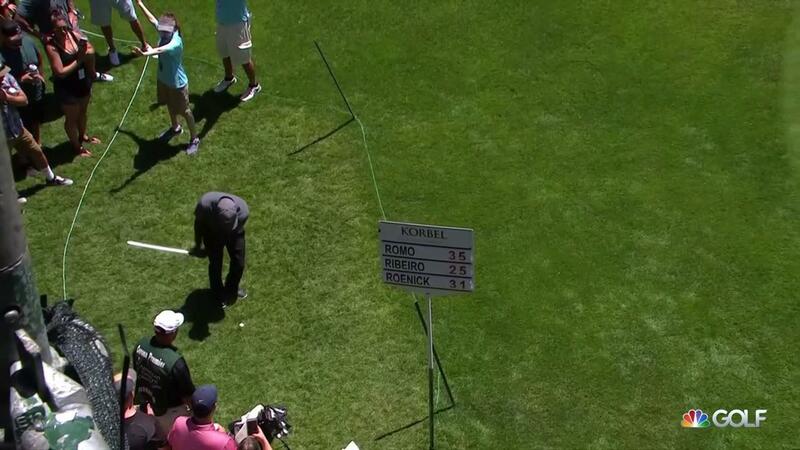 6 during his first round at the American Century Championship. 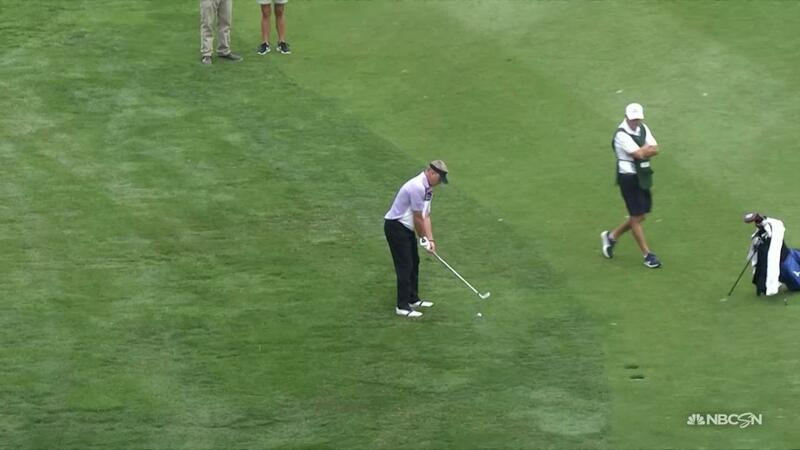 Notre Dame head football coach Brian Kelly knocks it within a few inches on hole No. 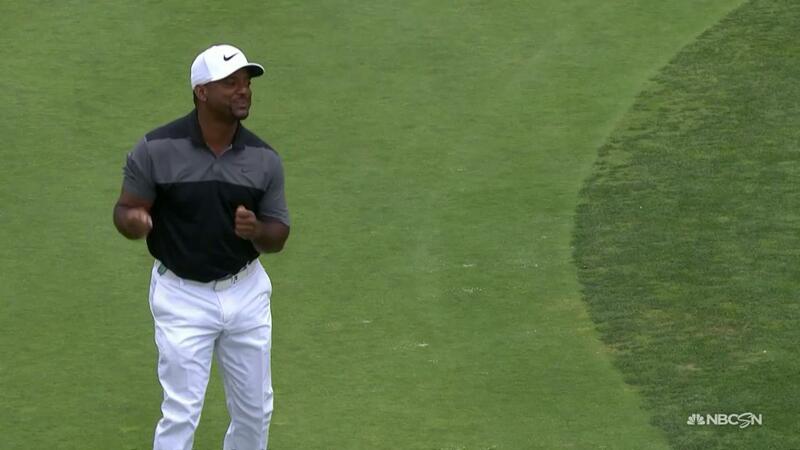 12 in his first round at the American Century Championship. 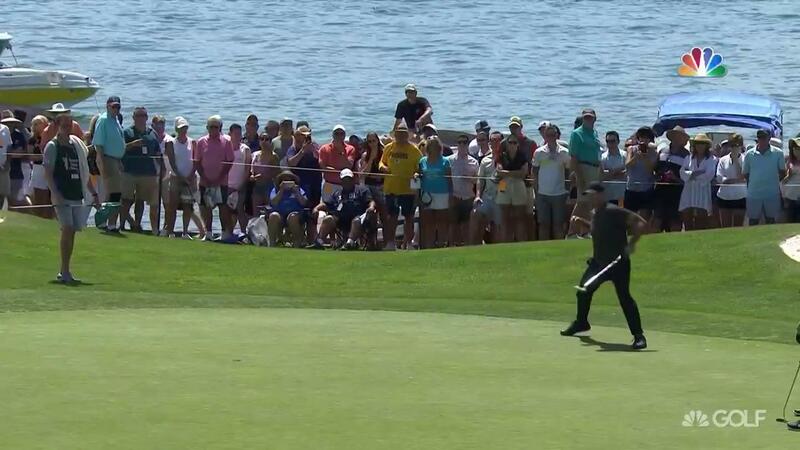 Aaron Rodgers shows off hisability to spin the ball with this nice approach on hole No. 6 at the American Century Championship. 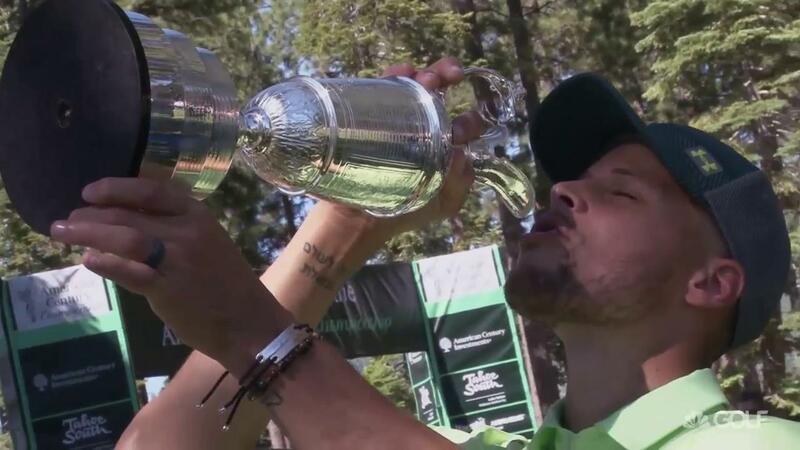 Lisa Cornwell caught up with Steph Curry at the American Century Championship where he got up close and personal with the Claret Jug and talks about grinding hard at golf. Former NFL linebacker A. J. Hawk gives Nikki B a tackling lesson at the American Century Championship. Who would celebs at ACC play for $10 million? 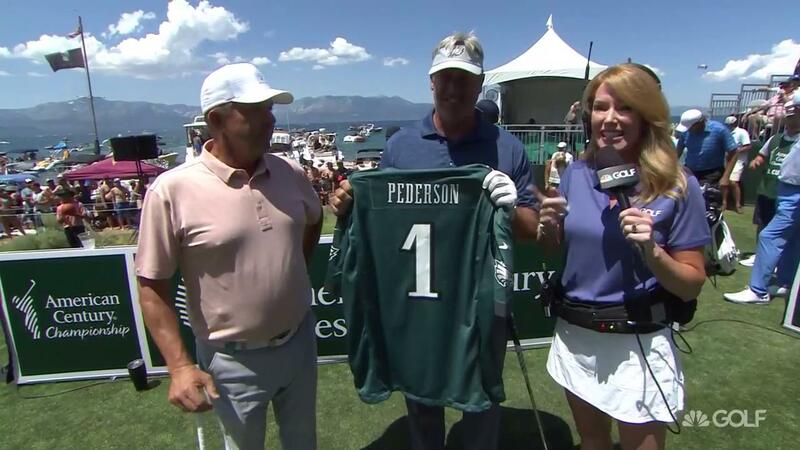 With the talk that Tiger Woods and Phil Mickelson will play each other for $10 million, we asked celebrities teeing it up at the American Century Championship tell us what rival they would face in a $10 million golf match. 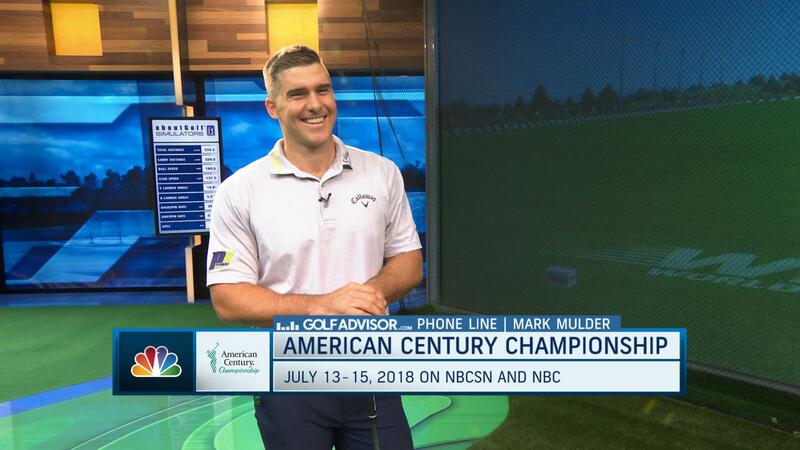 MLB pitcher and 3-time American Century champion Mark Mulder calls in to ‘Morning Drive’ to challenge 2017 Volvik World Long Drive champion Justin James to play this year in Lake Tahoe. 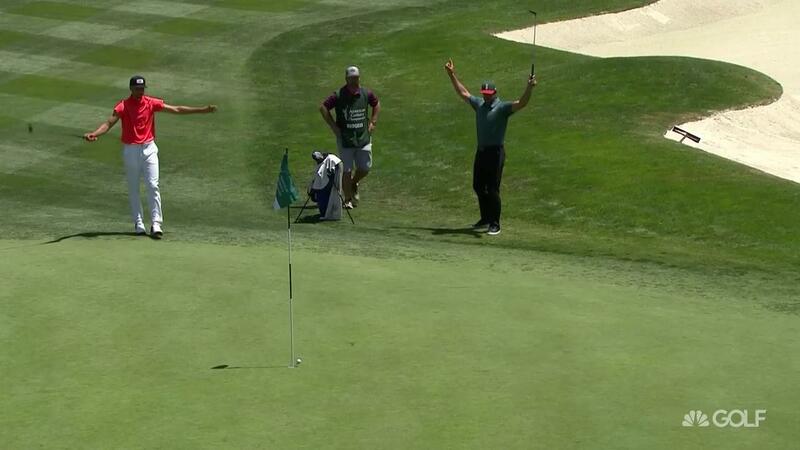 Watch Mark Mulder's putt that clinched his win at the 2017 American Century Championship. 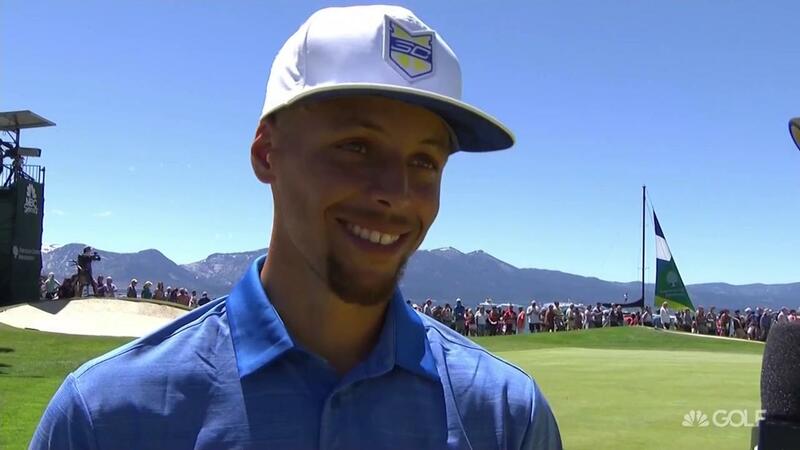 Charlie Rymer speaks to Steph Curry following his 28 point final round at the American Century Championship. Steph Curry sticks his approach close on No. 18 during Sunday's final round of the American Century Championship. Tony Romo hits a massive hook shot on No. 18 during the final round of the American Century Championship. Chad Pfeifer sticks his tee shot close on No. 17 during the final round of the American Century Championship. 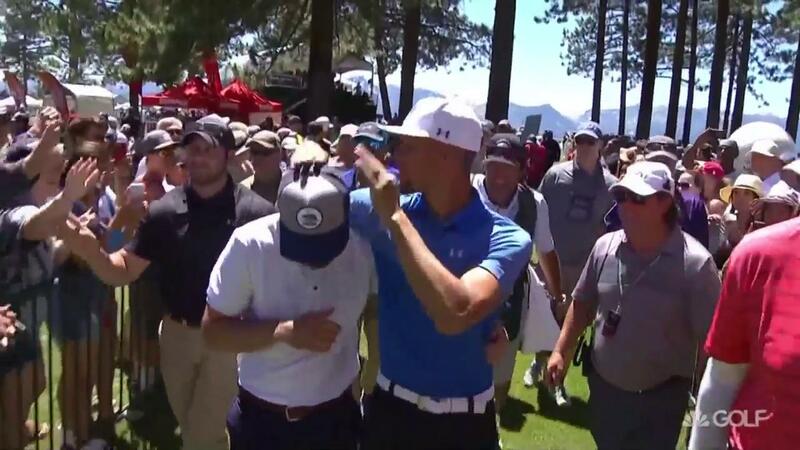 Steph Curry plays the bongos on Justin Timberlake's head during the walk to No. 18 on the final day of the American Century Championship. 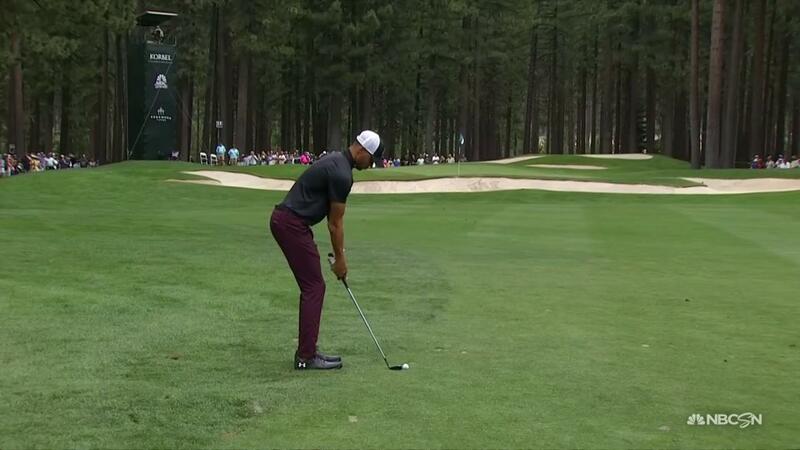 Steph Curry does his best Tiger Woods impersonation on No. 17 during the final round of the American Century Championship. 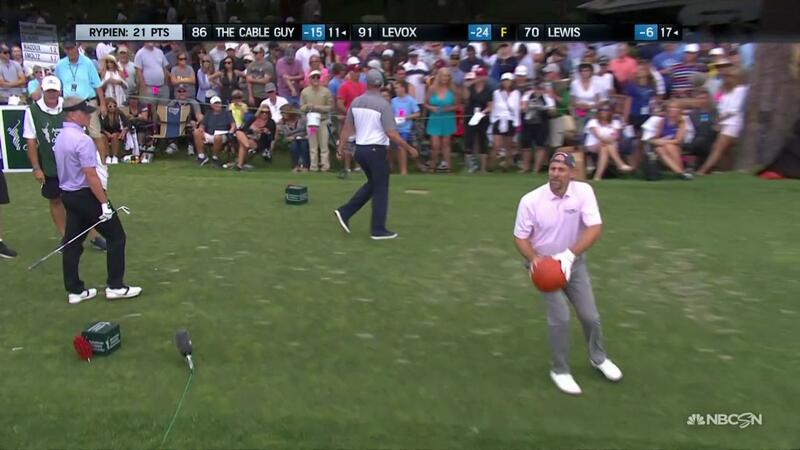 Jeremy Roenick goes WWE on his playing partner Kevin Millar during the final round of the American Century Championship. 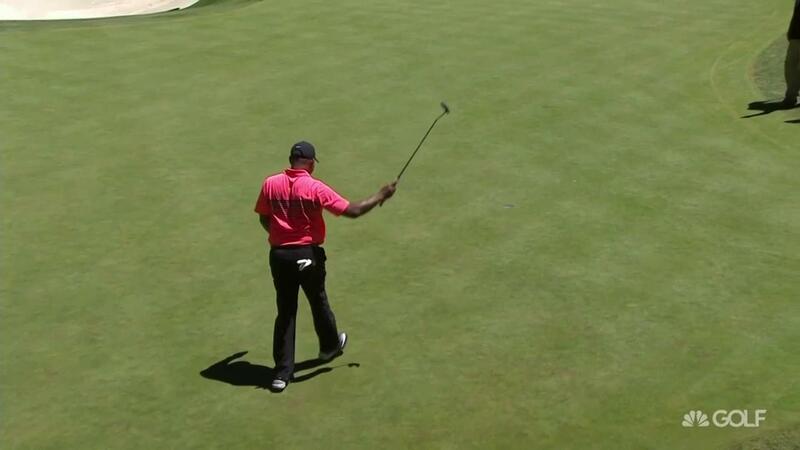 Marvin Lewis drains a long putt on the 7th hole during the final round of the American Century Championship. 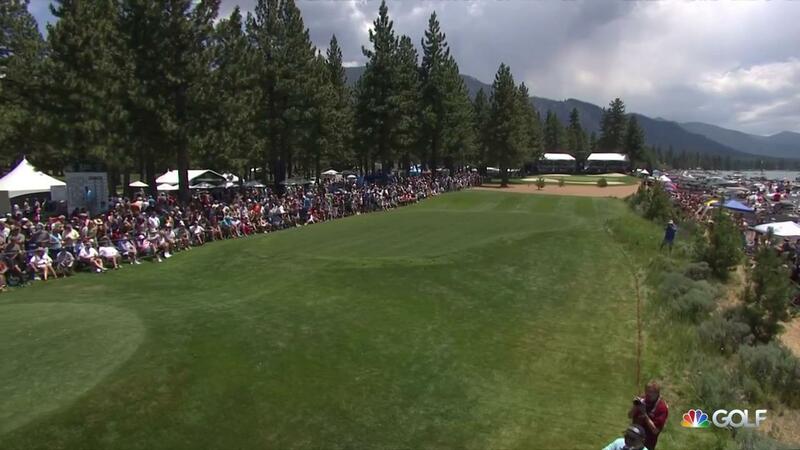 Watch Paige Spiranac's tee shot on No. 17 during the final round of the American Century Championship. 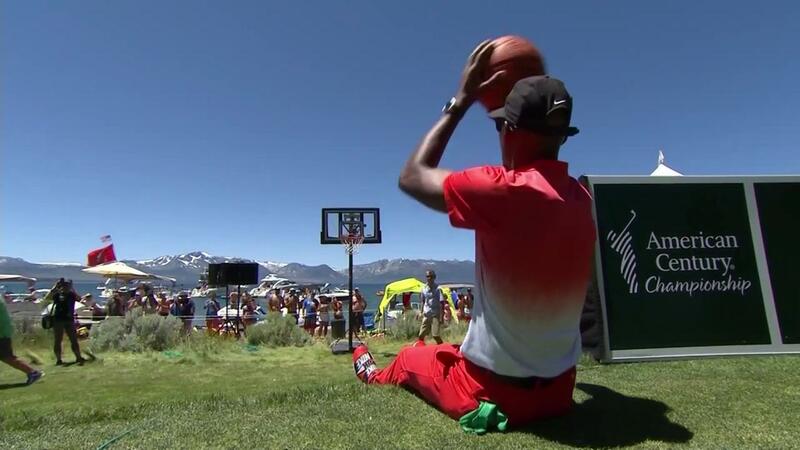 Ray Allen shows off his shooting stroke from the ground during the final round of the American Century Championship. 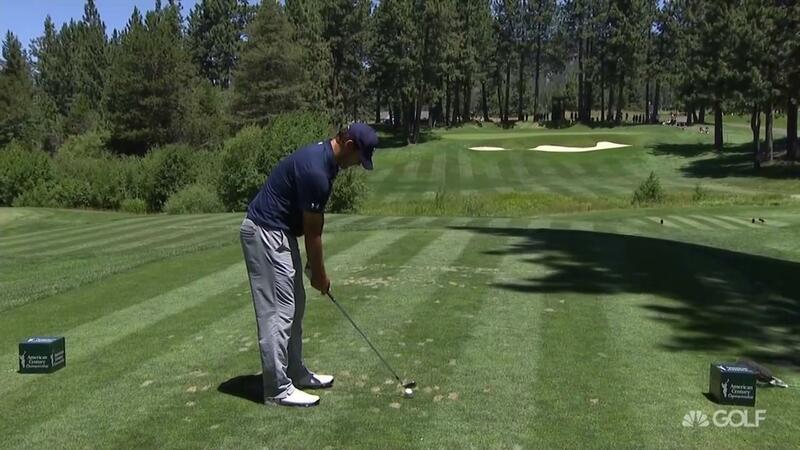 Tony Romo makes it look easy on the par-3 12th hole during the final round of the American Century Championship. Steph Curry goes pin hunting on No. 12 during the final round of the American Century Championship. 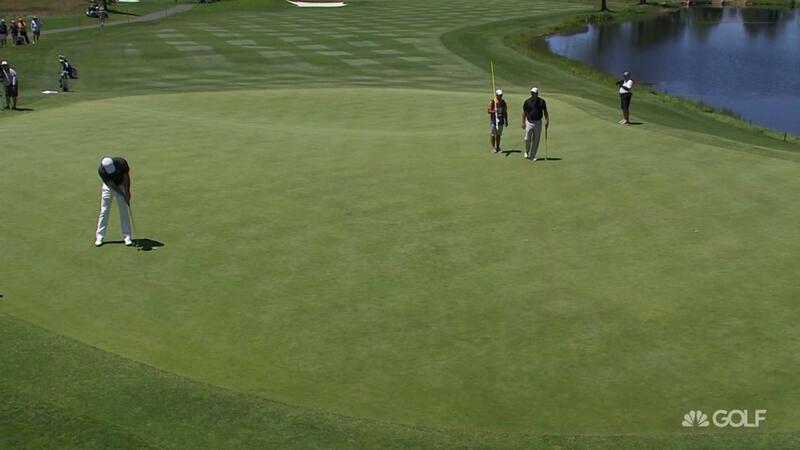 Watch Mark Mulder drain his long par putt on No. 10 during the final day of the American Century Championship. 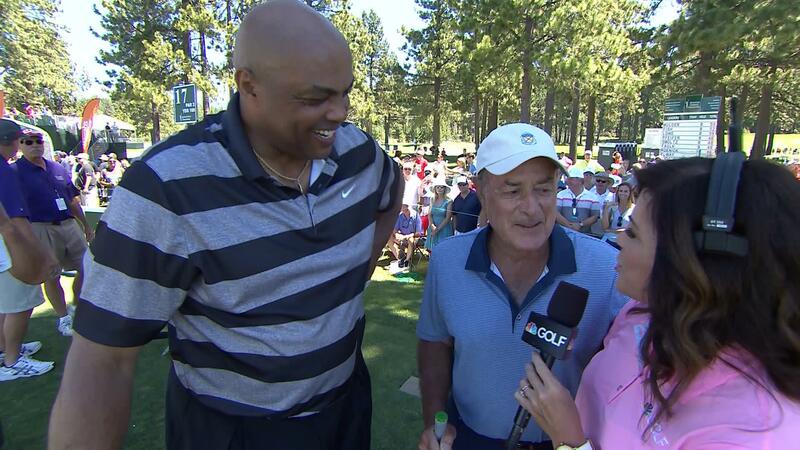 Michele Tafoya talks to Al Michaels and Charles Barkley during the final round of the American Century Championship. 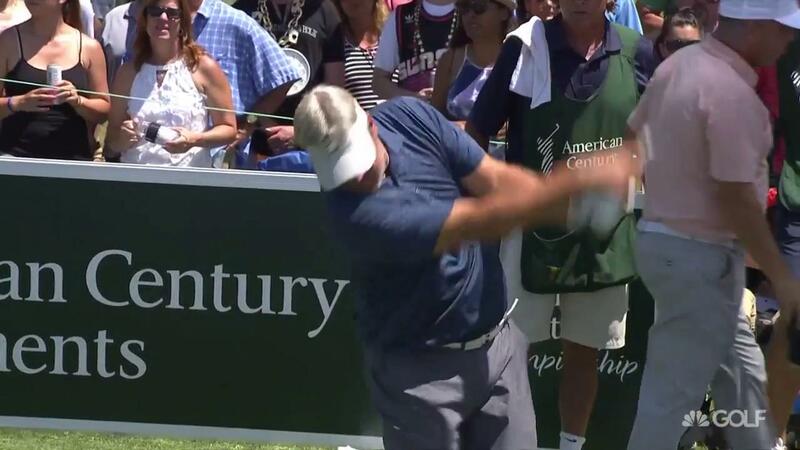 Charles Barkley is willing to try anything in competition including this one arm swing during the final round of the American Century Championship. Catch the early round highlights from the final round of the 2017 American Century Championship. 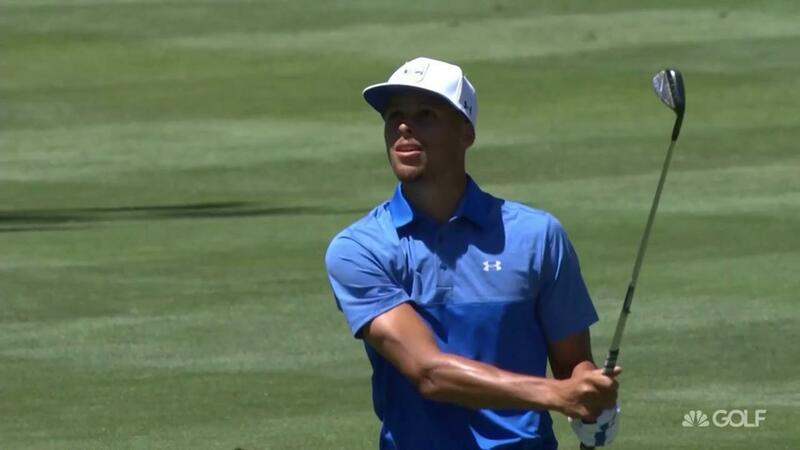 Steph Curry nearly jars his approach on the par-4 10th hole during the final round of the American Century Championship.